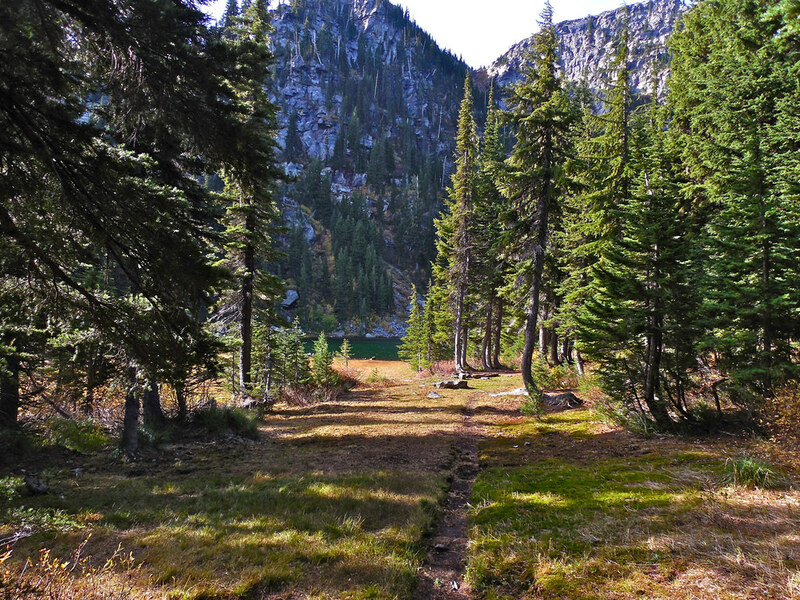 Another mile and a half on the trail past Upper Geiger Lake is Lost Buck Pass which crosses the Cabinet Divide just below Carney Peak, at an elevation of about 6,000 feet. 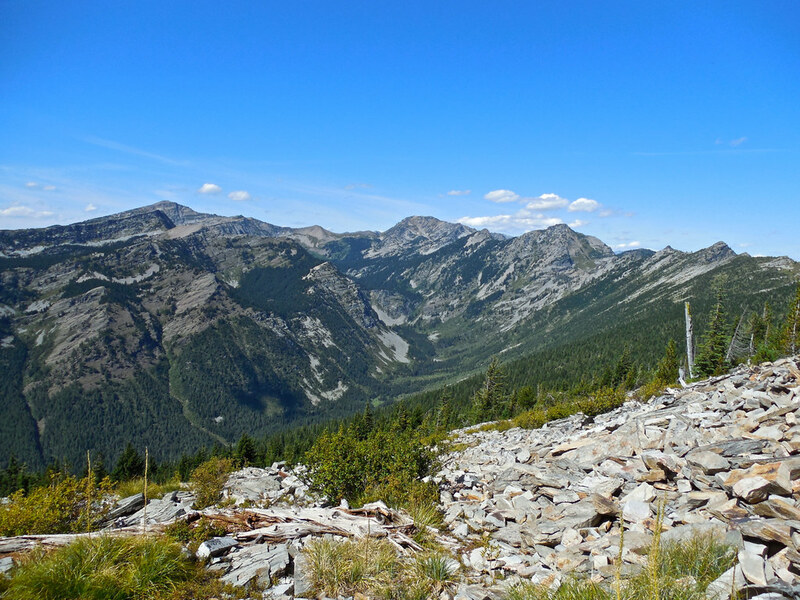 Looking east from the pass you can see Upper Geiger Lake and beyond, the Vermilion River watershed. 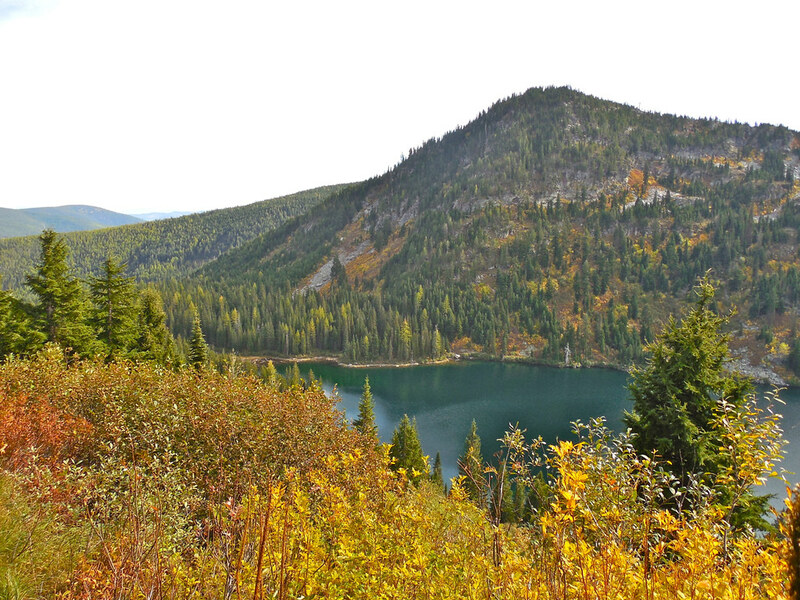 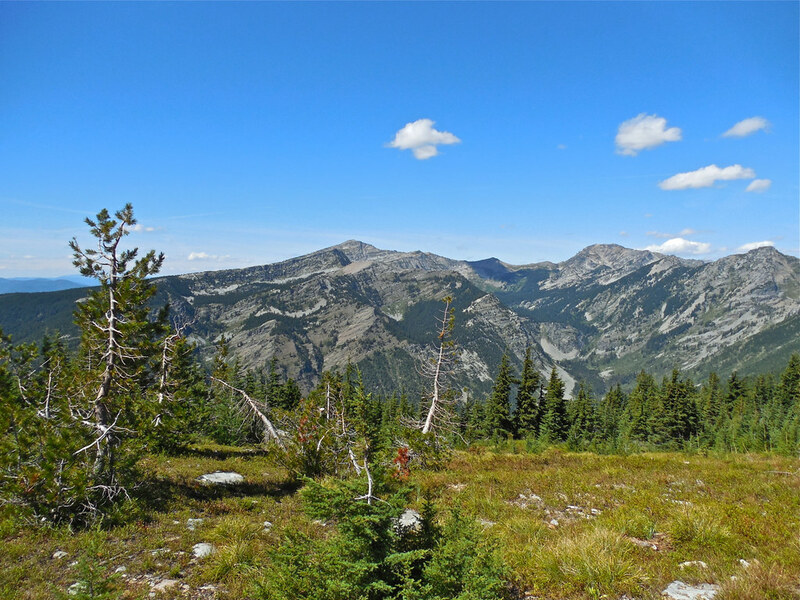 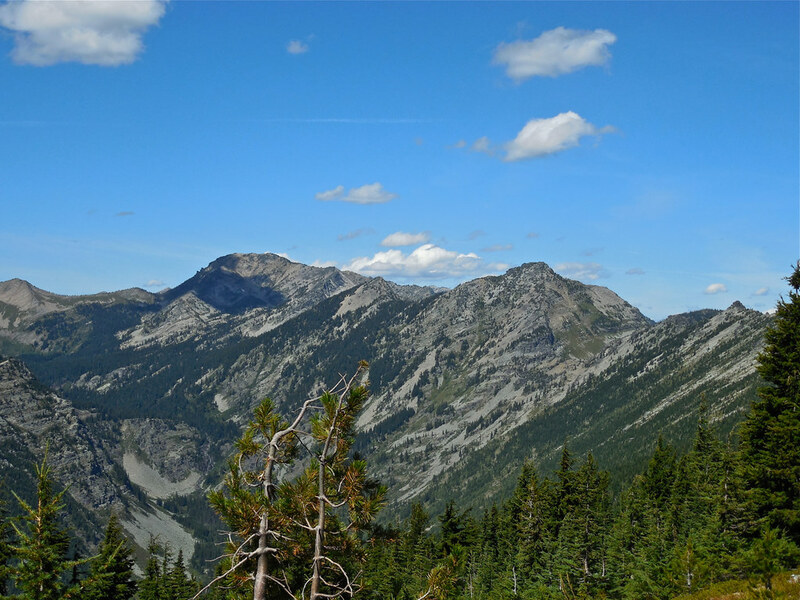 The view to the west includes Wanless Lake, Engle Peak, and Goat Peak. 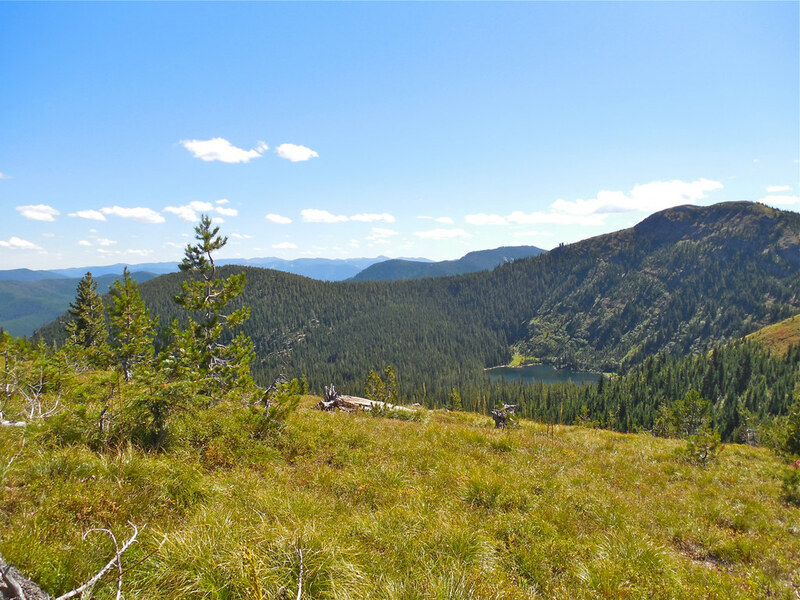 To the south you look down the entire length of the Swamp Creek drainage and the Clark Fork River can be dimly seen far in the distance. 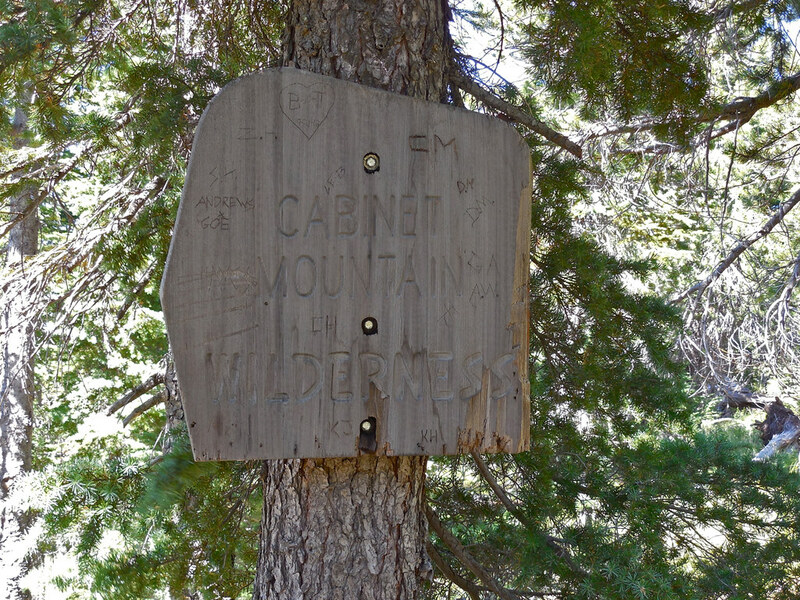 Cabinet Wilderness trail 656 part 2. 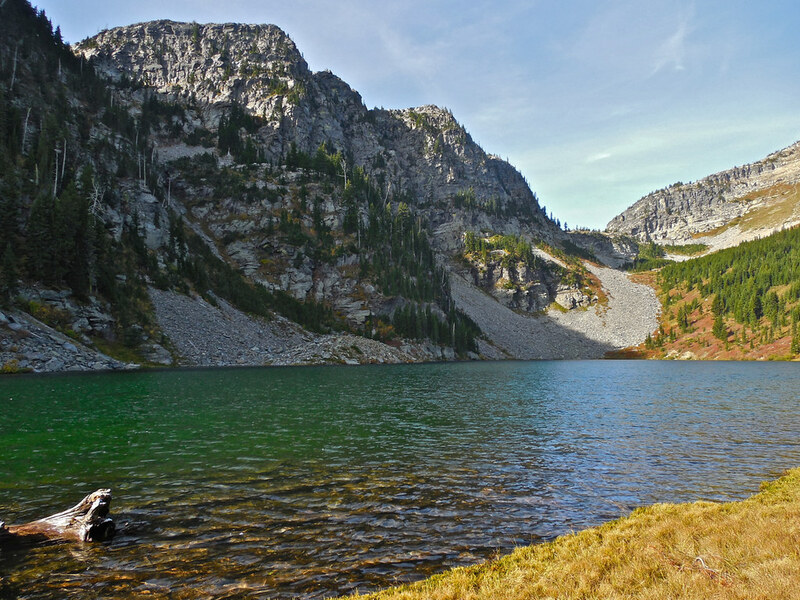 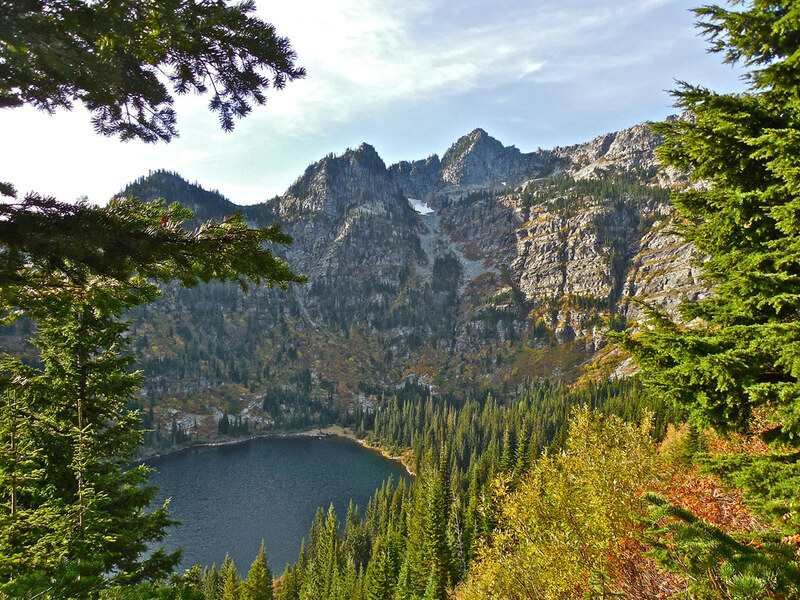 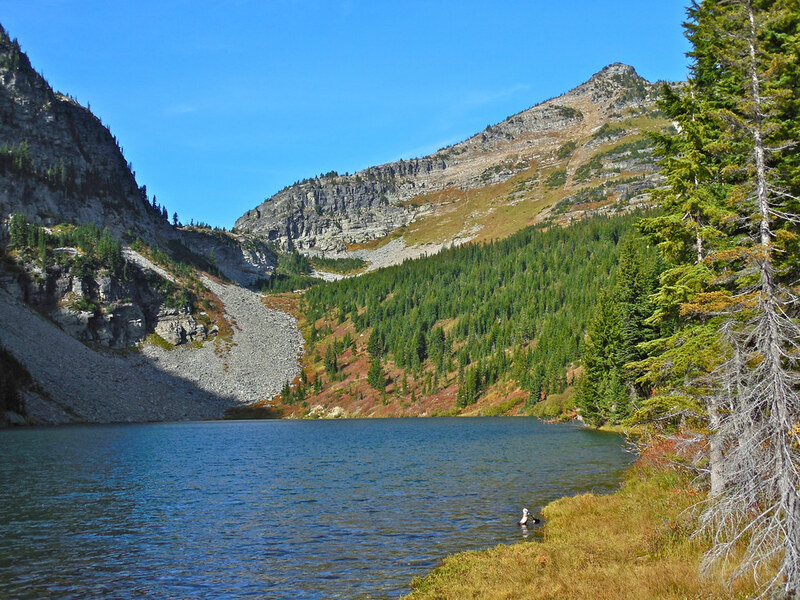 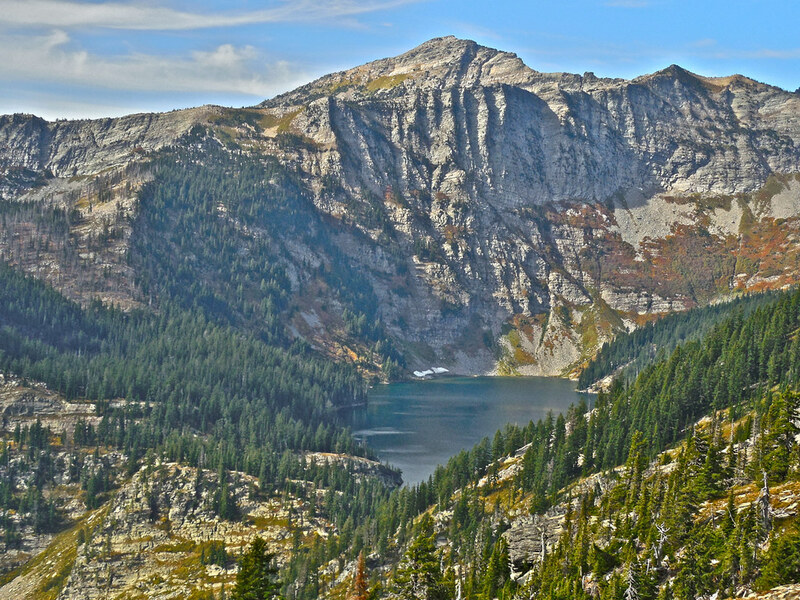 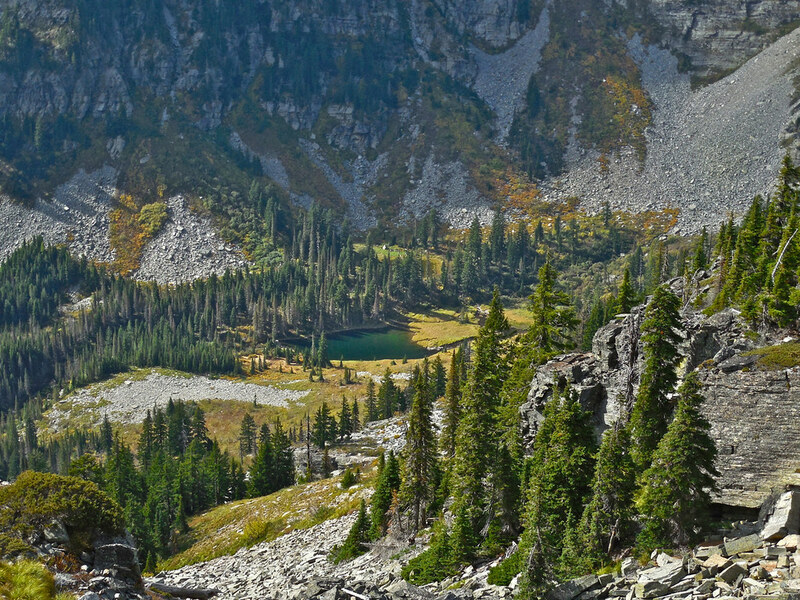 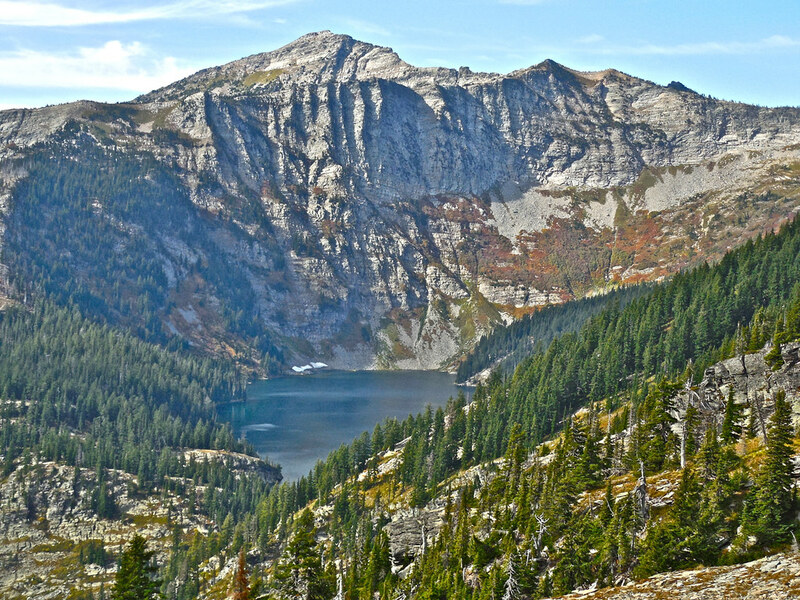 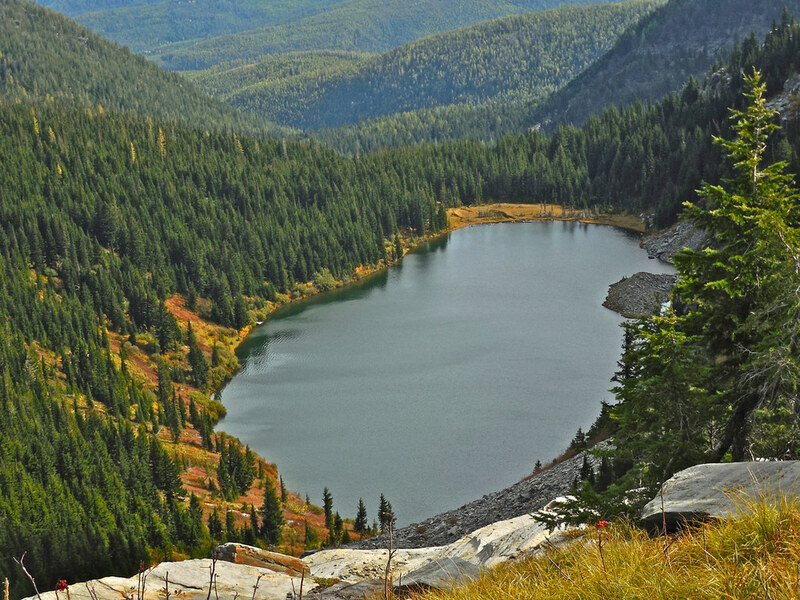 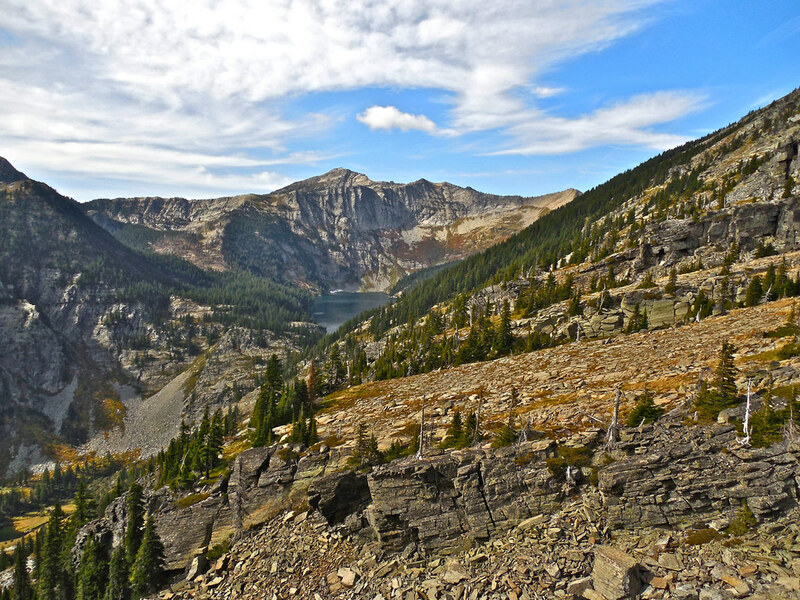 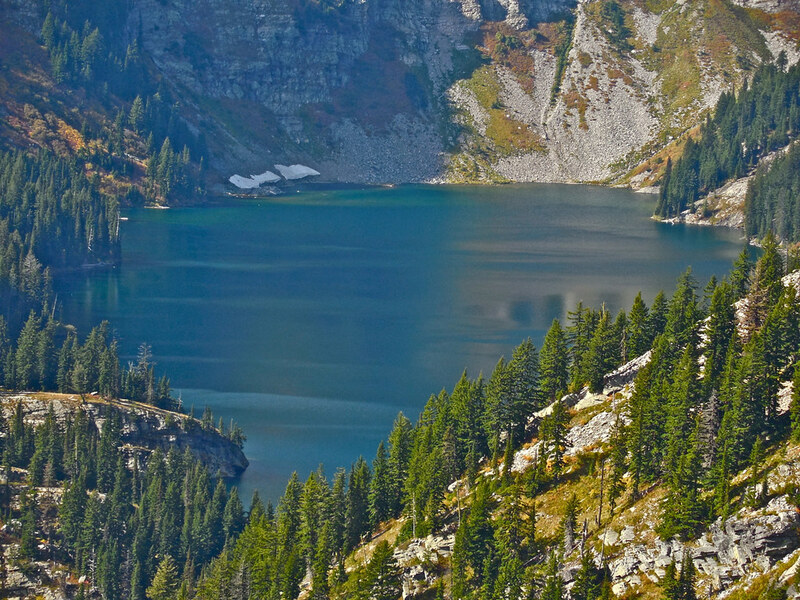 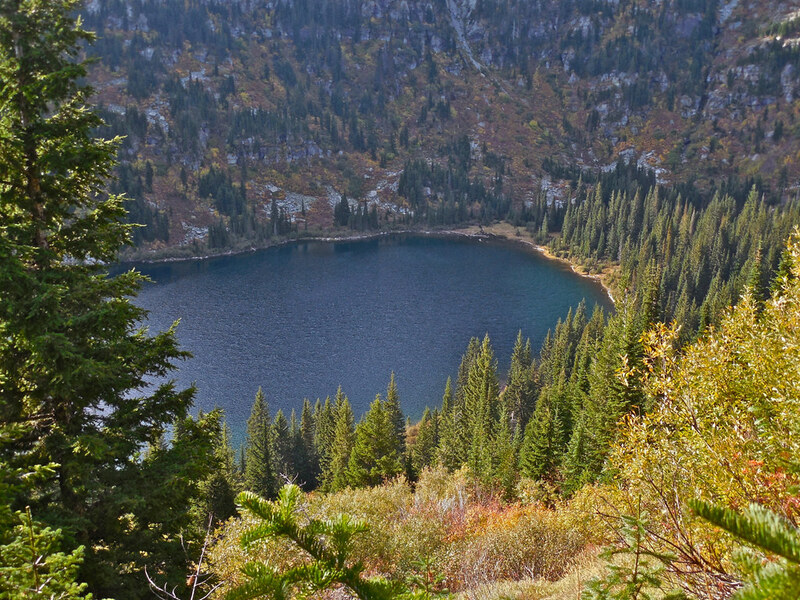 A mile or so and another 600 feet in elevation above Lower geiger Lake sits Upper Geiger Lake. 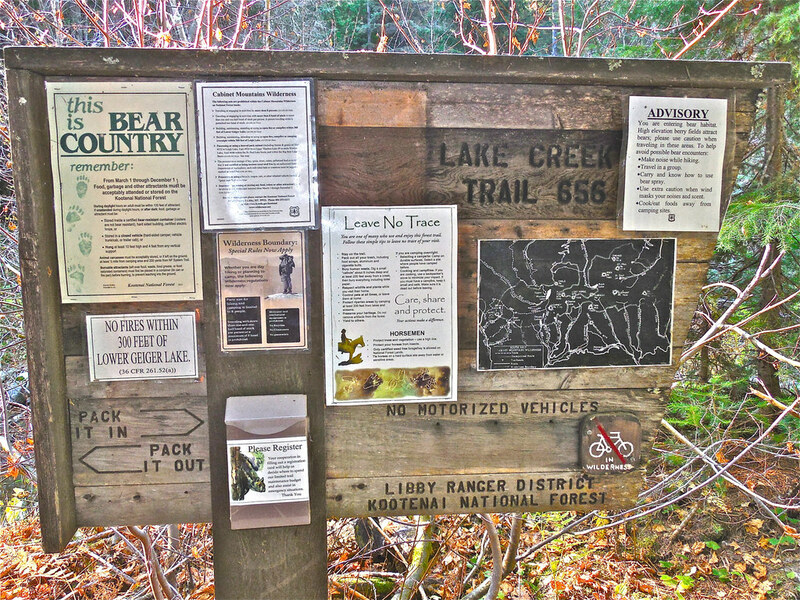 To visit the lake itself you can take a short trail off 656 for about a half mile (the Wilderness map calls it trail # 48 but there’s no sign for it so I wonder why they bothered numbering it). 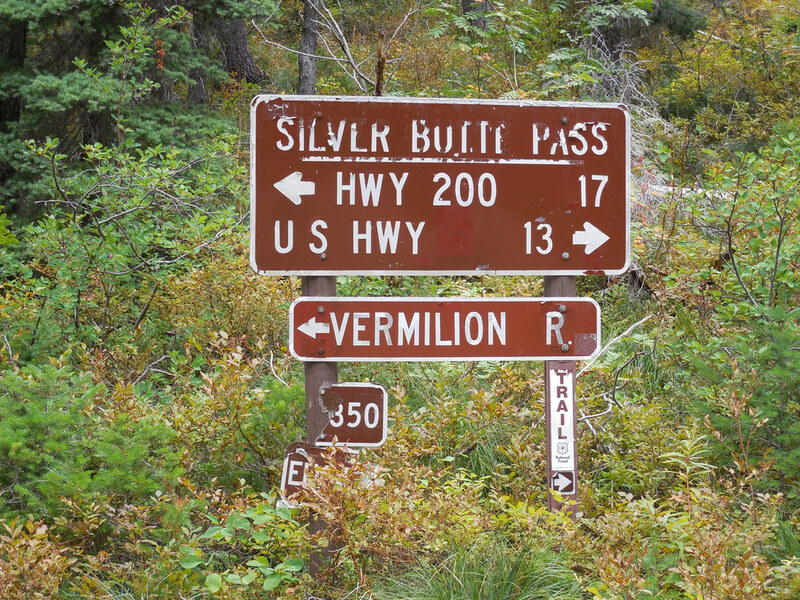 There is a sign at the junction with an arrow pointing toward the lake. 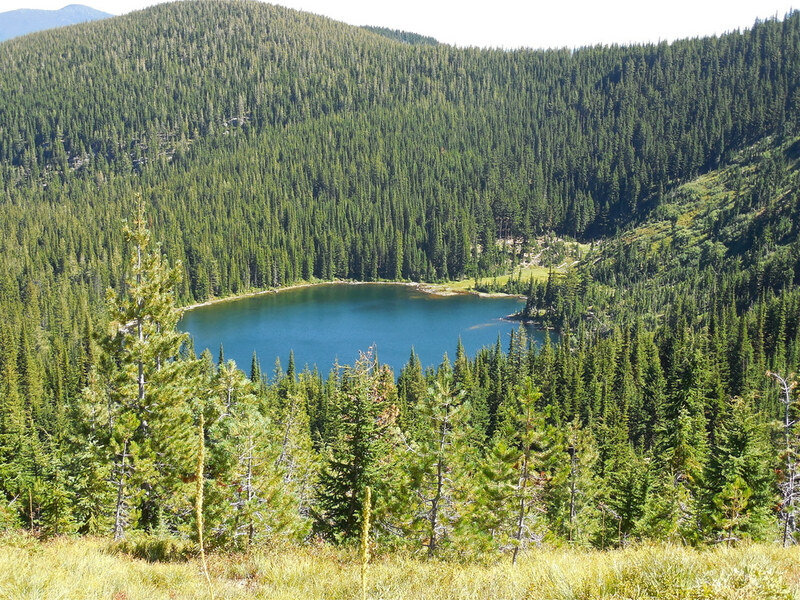 It’s well worth the short side trip. 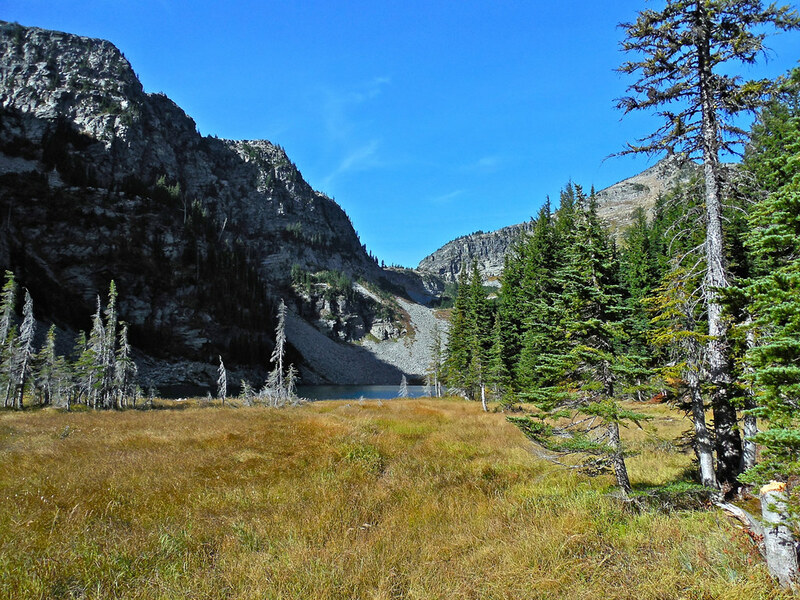 Upper Geiger is smaller than the lower lake, but lots of folks get tired by the time they reach the lower one and so Upper Geiger receives far fewer visitors. 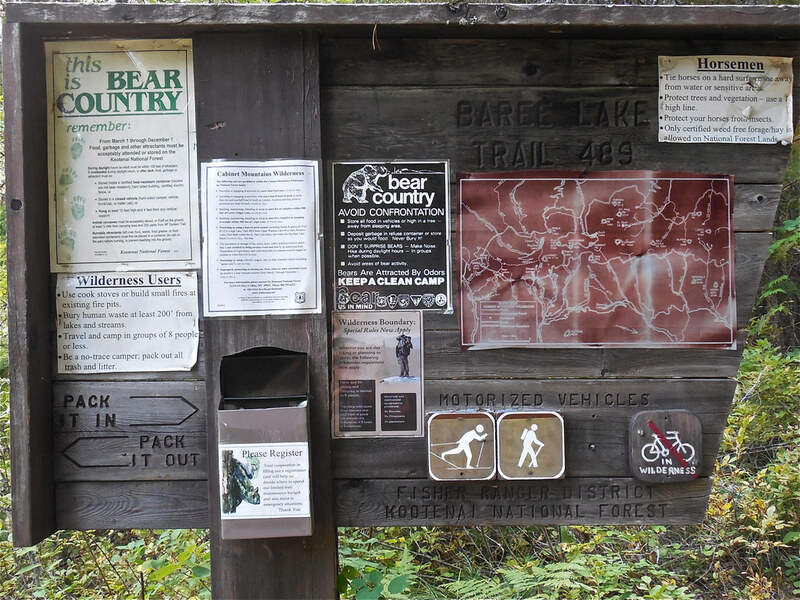 You can tell by the signs of use on the trail. 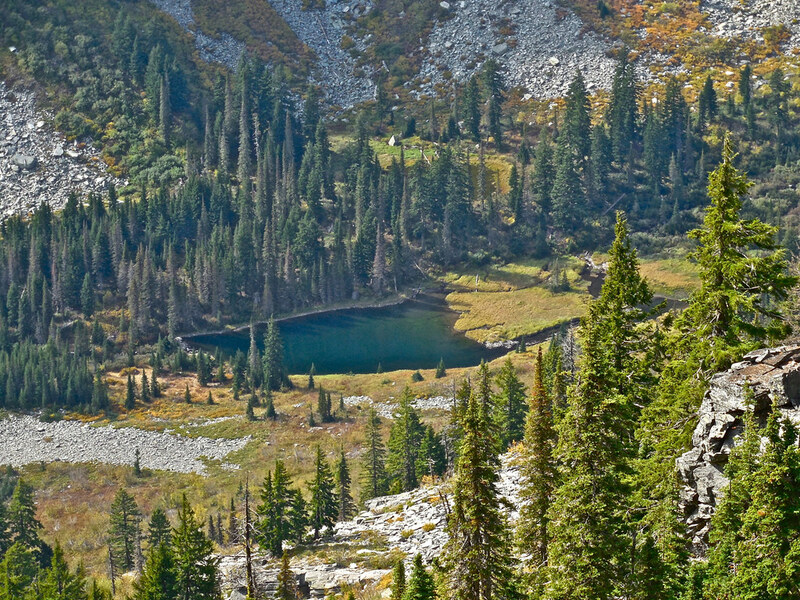 The gap that is visible in the cliffs and mountainside at the far end of the lake is Lost Buck Pass and the last three photos were taken from there. 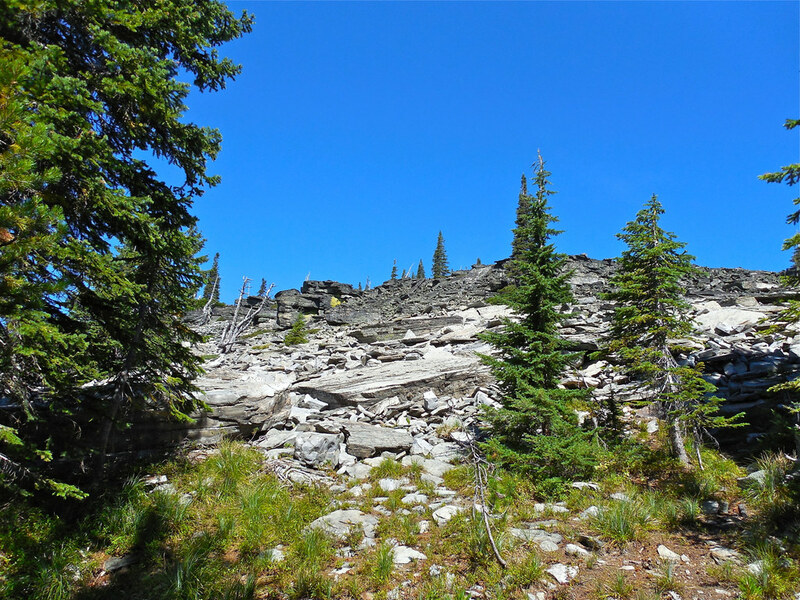 Cabinet Wilderness trail 656 part 1. 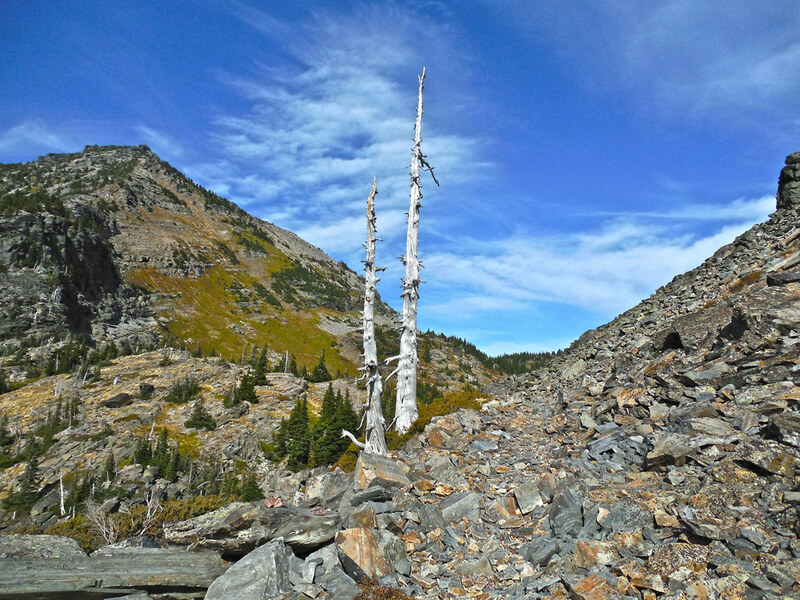 Some time around the turn of the twentieth century near a pass in the southern part of the high mountain area in western Montana that is now known as the Cabinet Mountains Wilderness, a herder who was tending sheep was killed by lightning and a crew had to go up to gather the “bucks” and lost sheep. 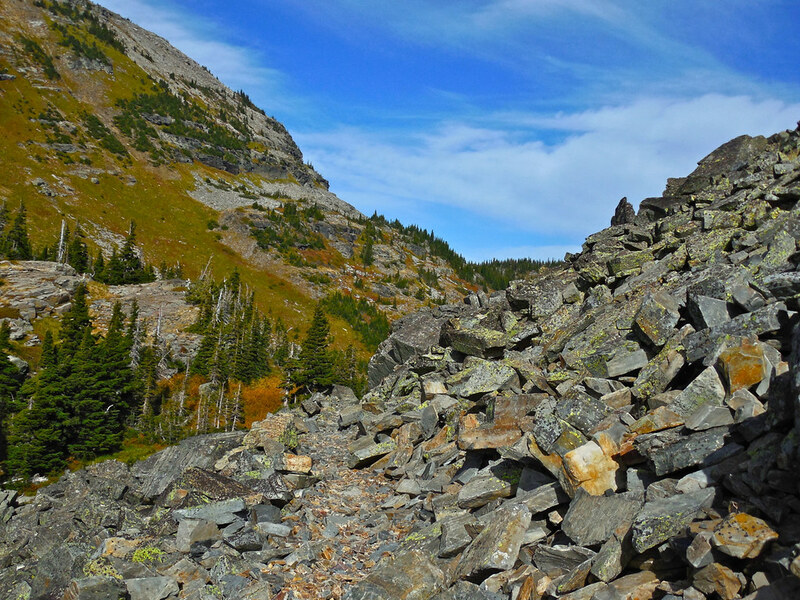 The pass was then named “Lost Buck Pass” and the photo in my last post was taken from there. 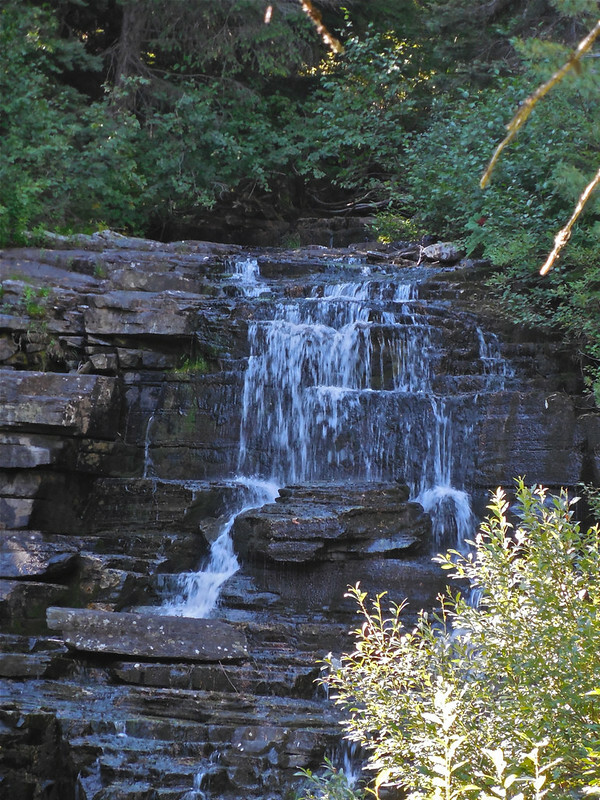 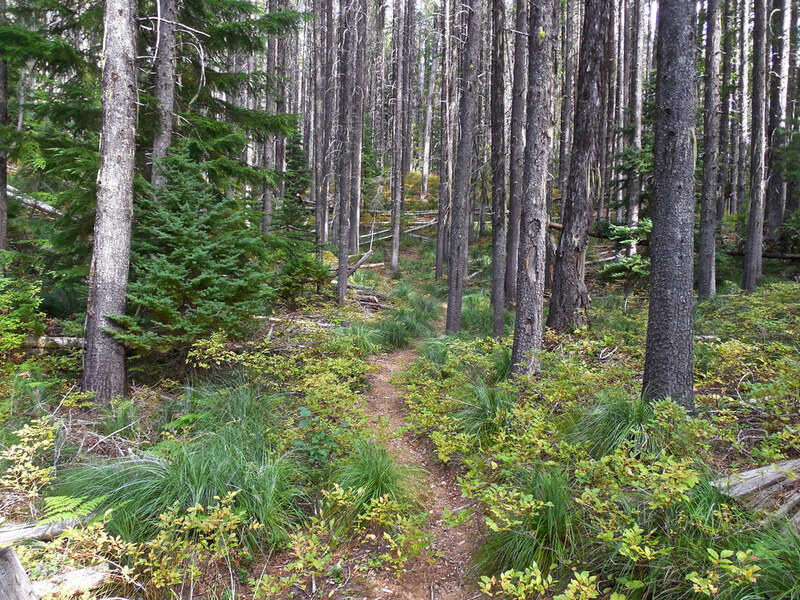 Today the area can be accessed on foot or horseback by several trails. 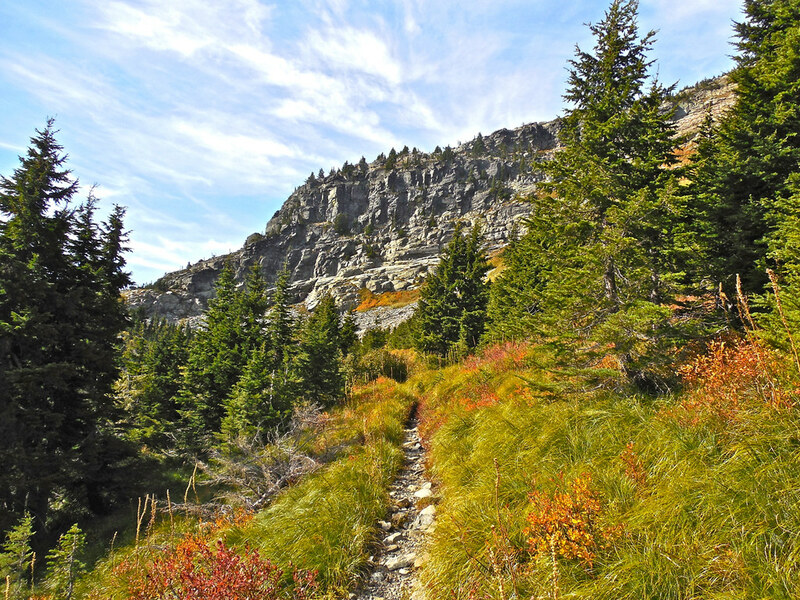 The one we chose for our trip on October fifth was trail 656. 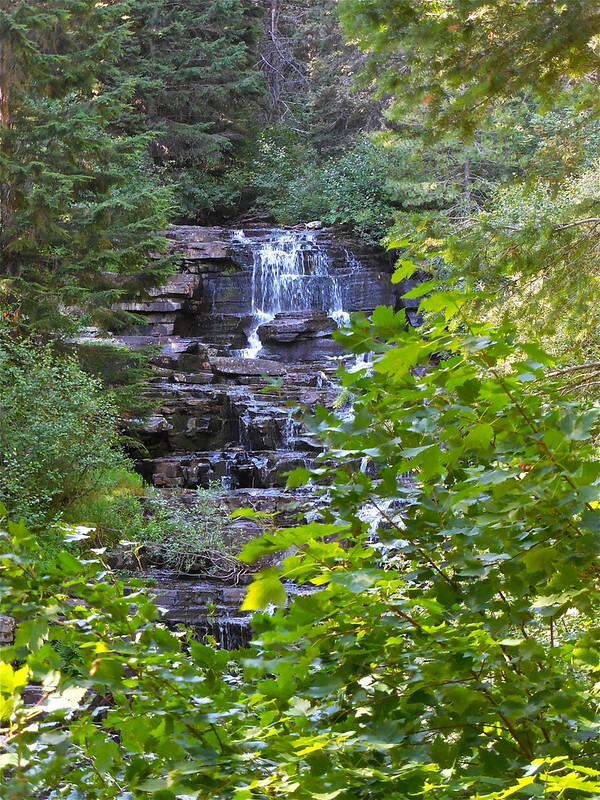 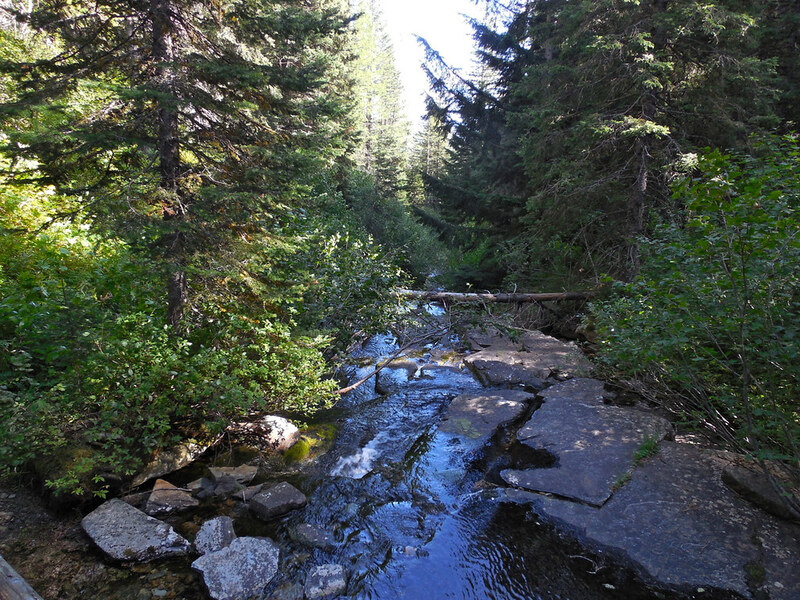 To get to the trail head, turn west off U.S. Highway 2 about 17 miles south of Libby, Montana onto West Fisher Creek Road (number 231), follow it approximately 6 miles and turn south onto Road 6748; proceed about 2 more miles to the trail head. 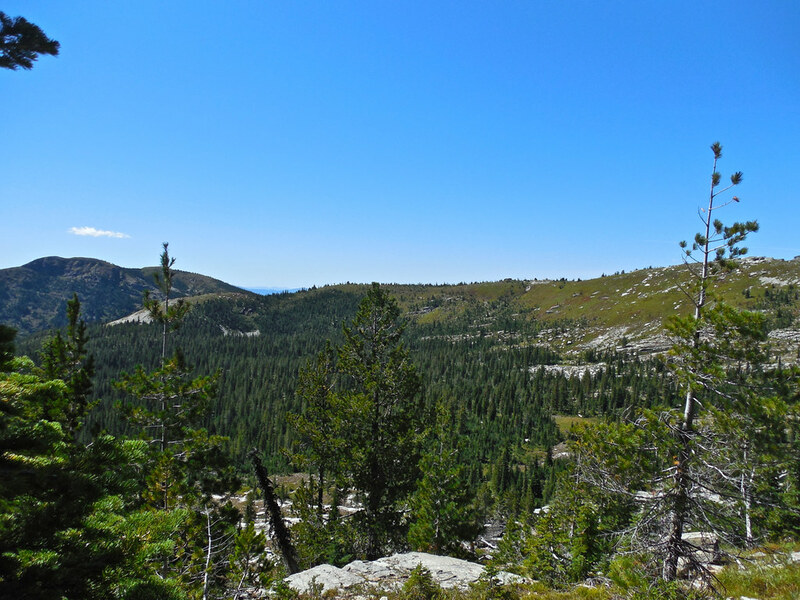 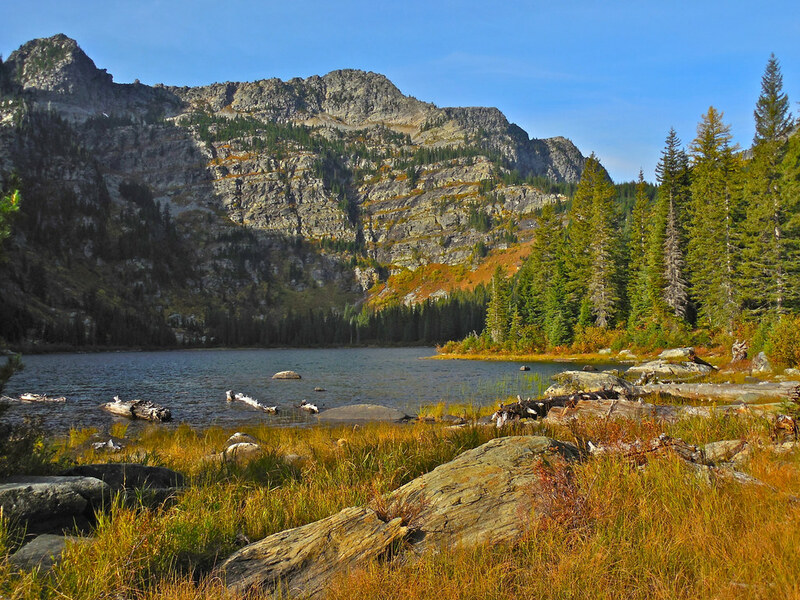 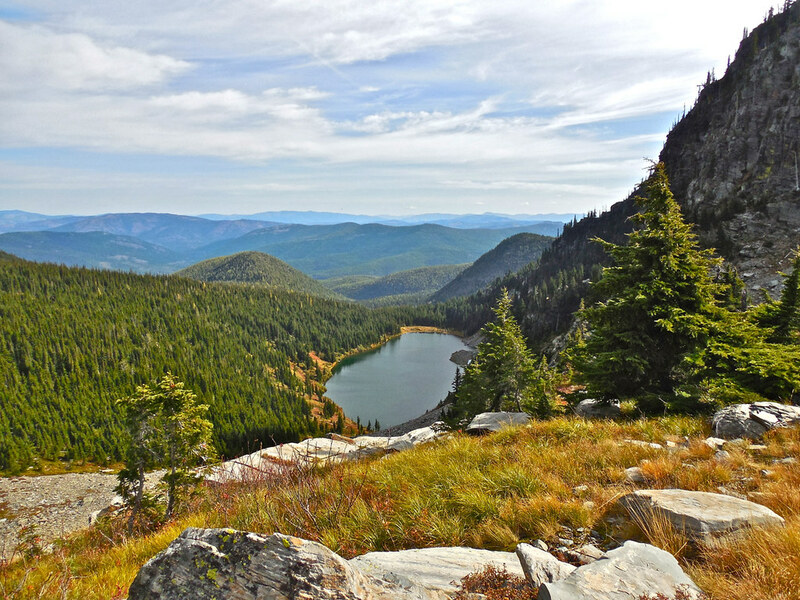 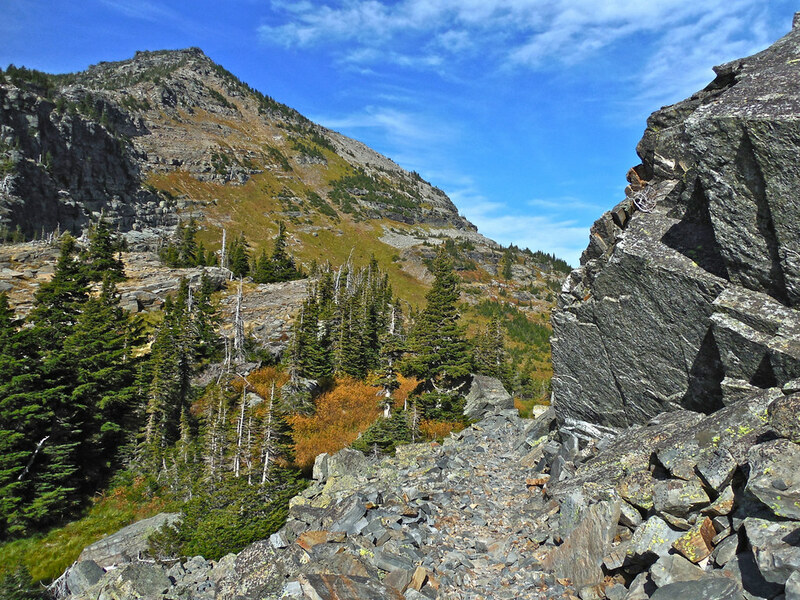 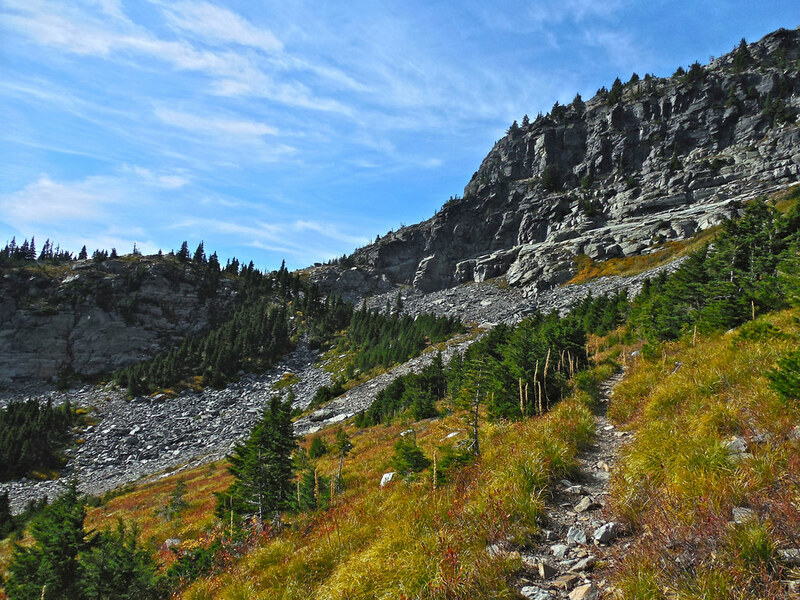 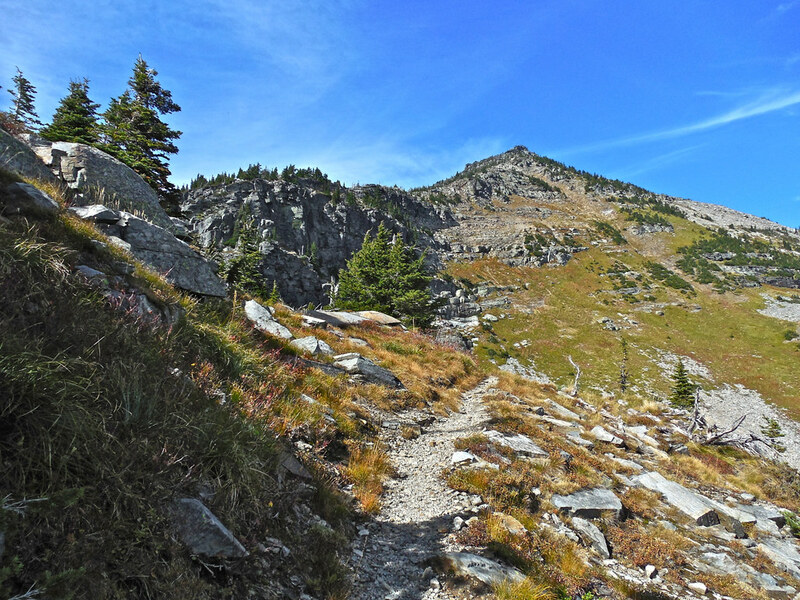 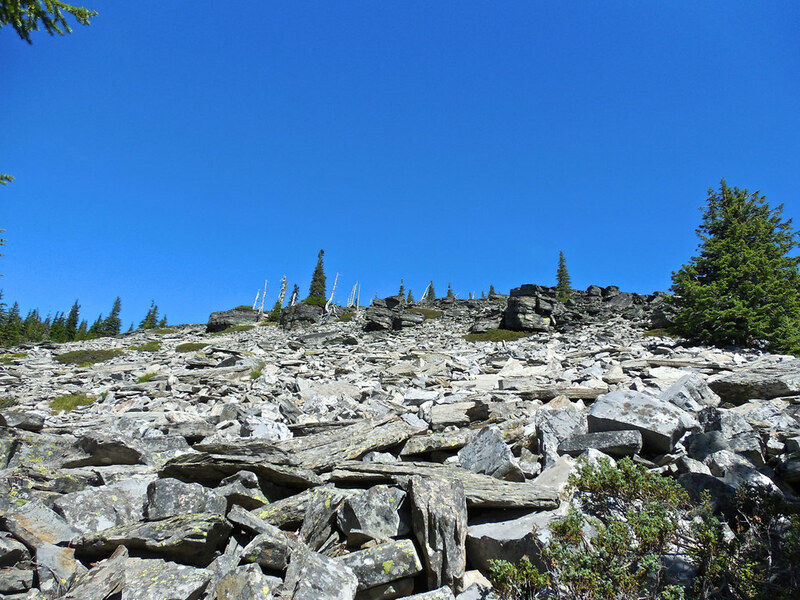 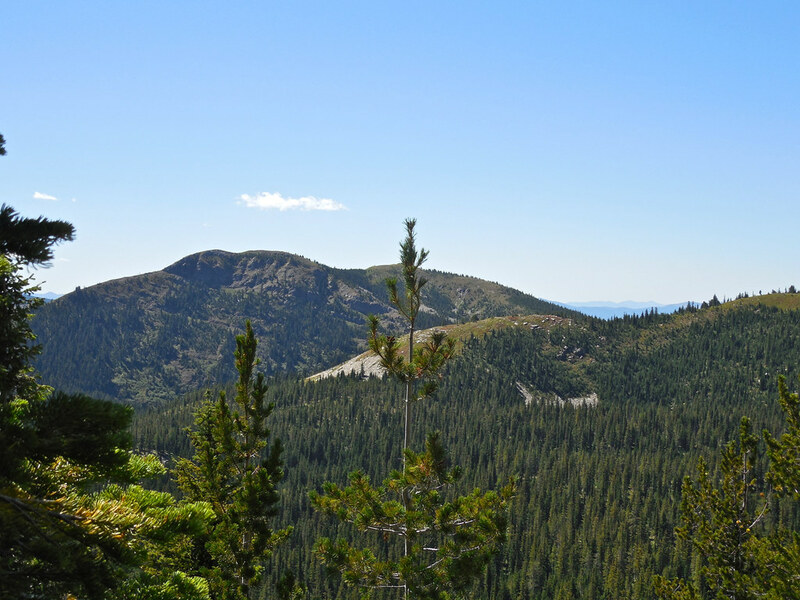 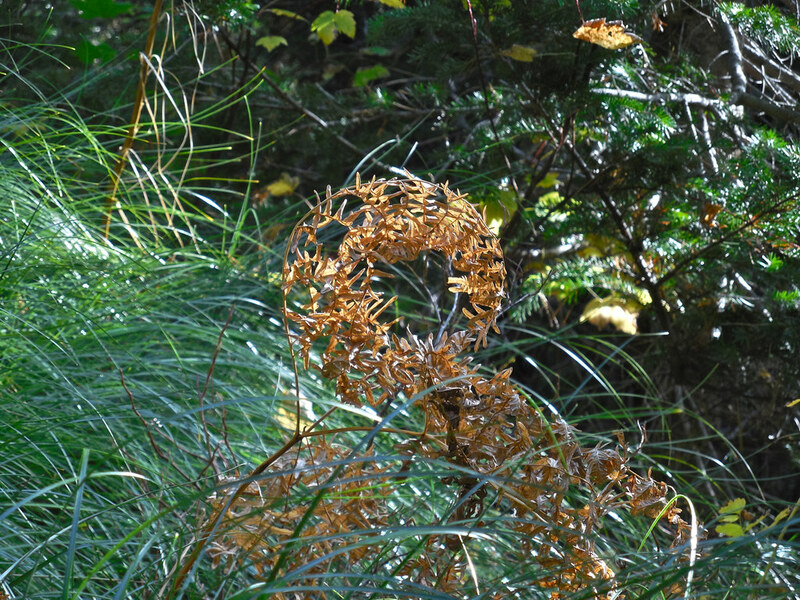 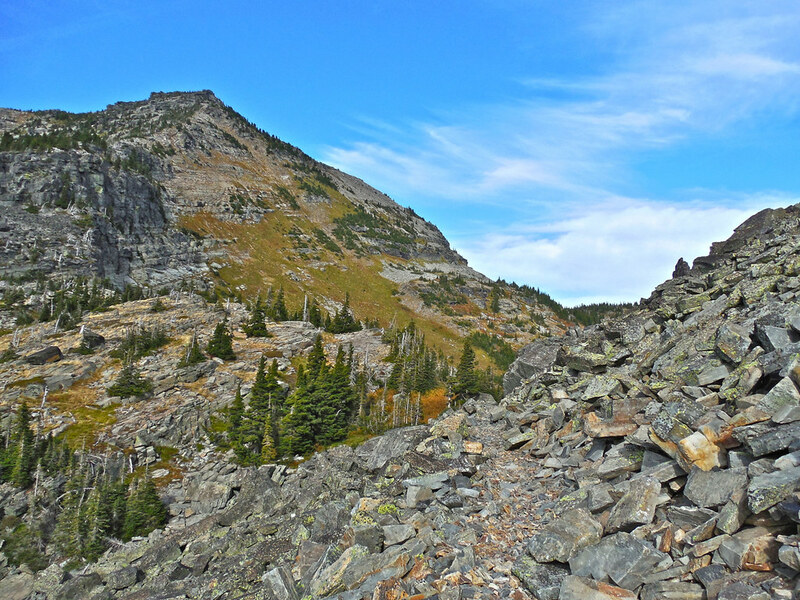 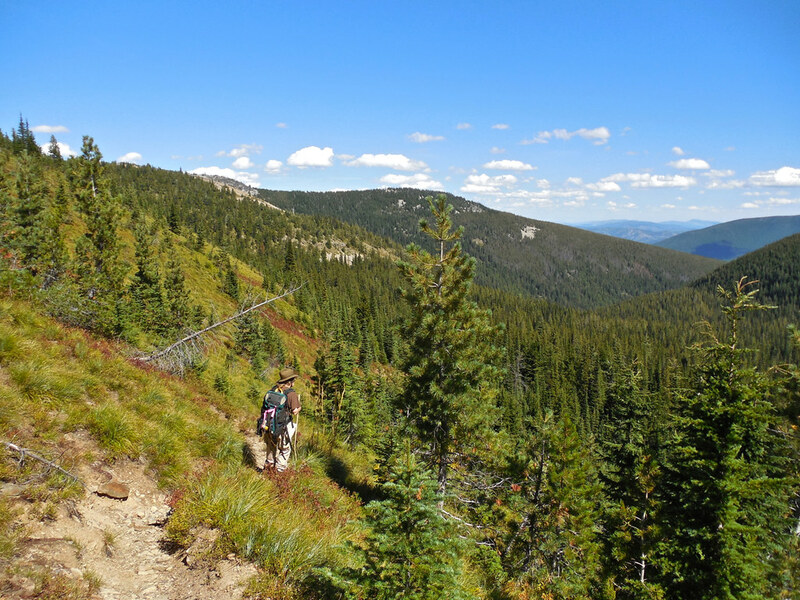 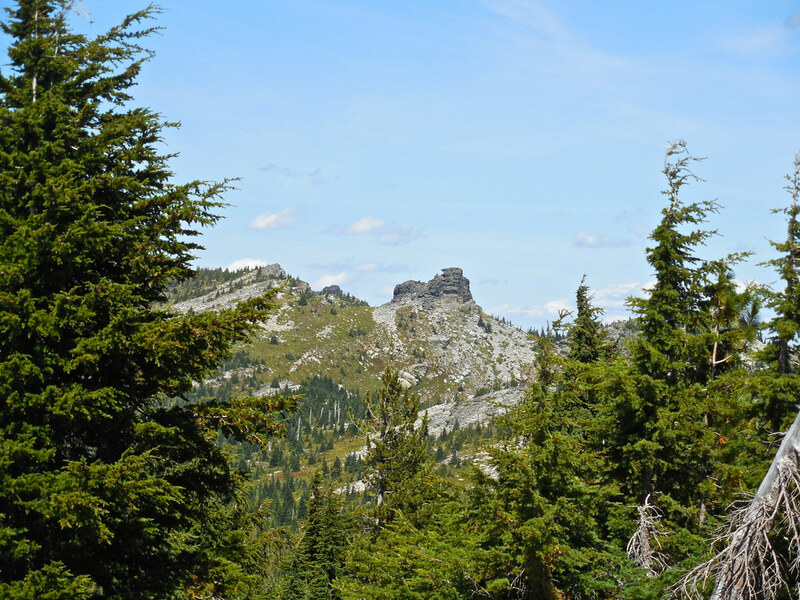 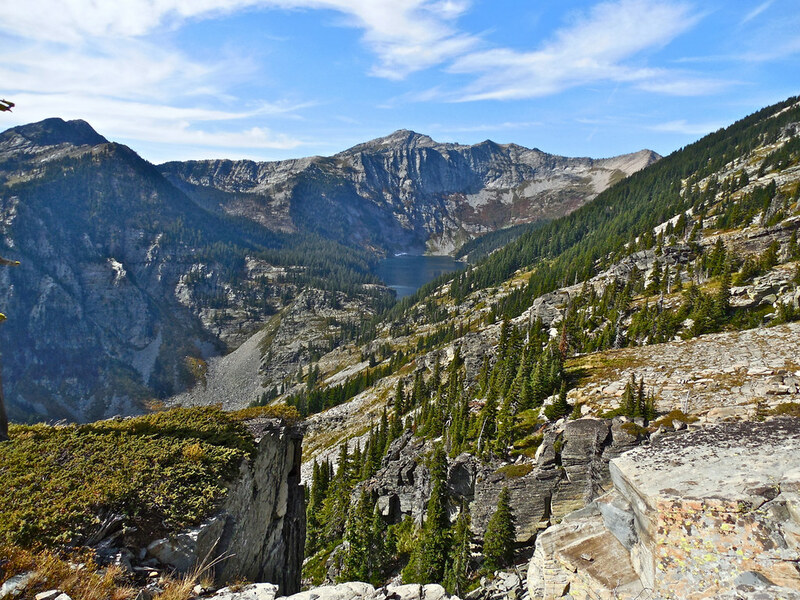 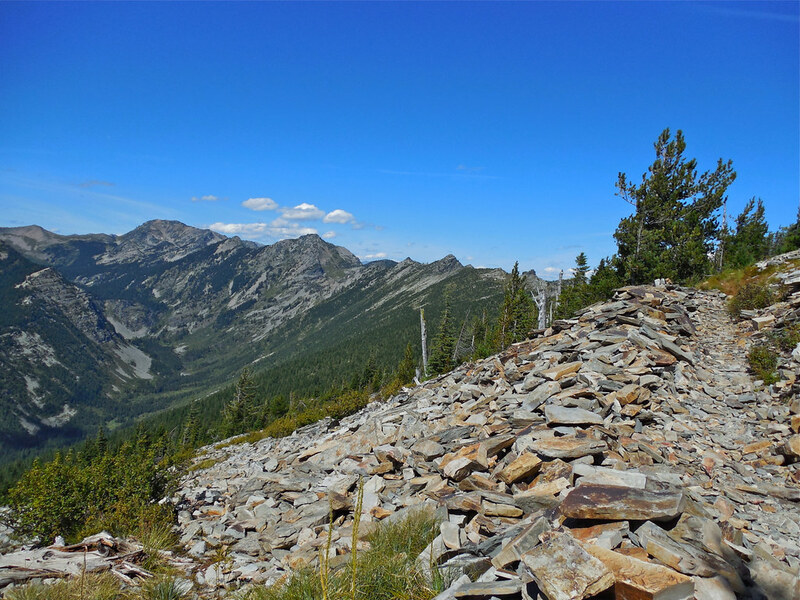 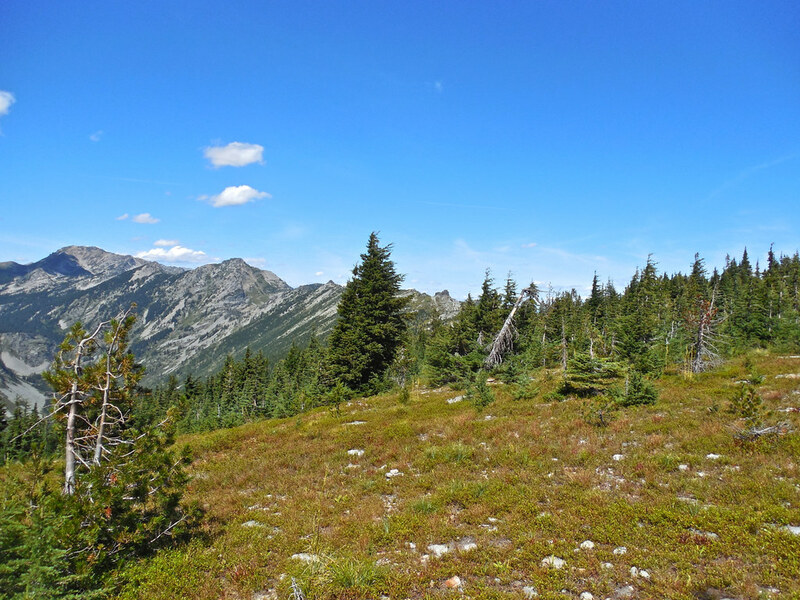 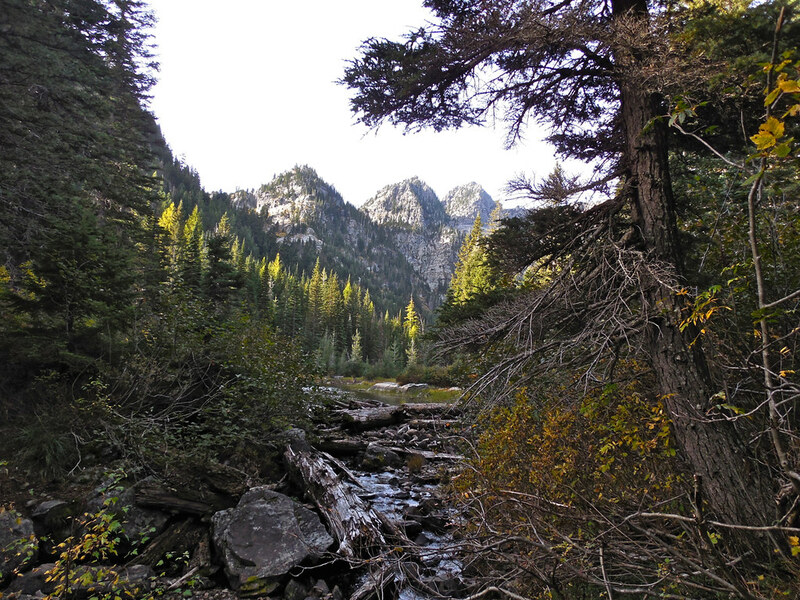 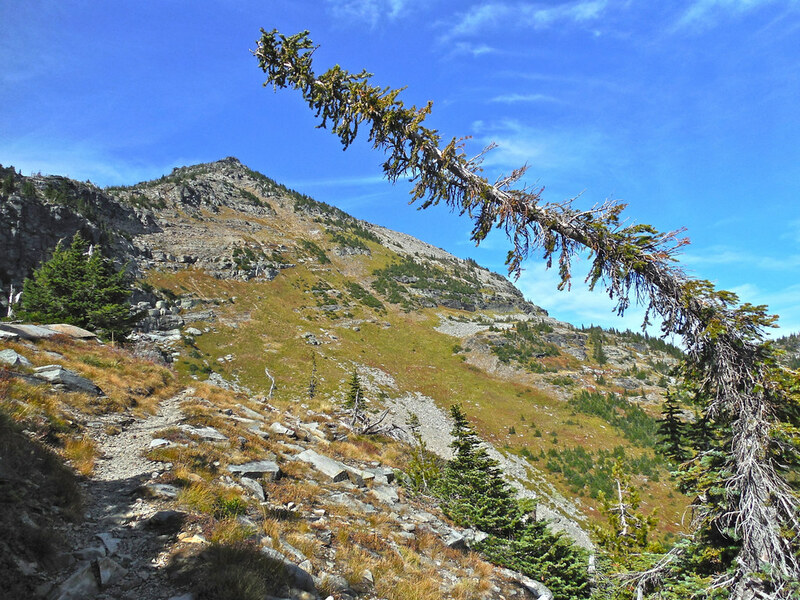 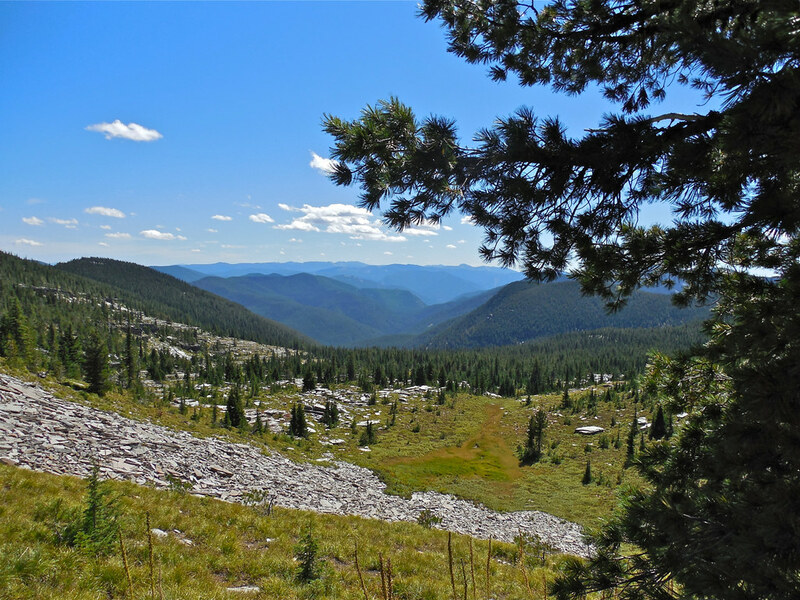 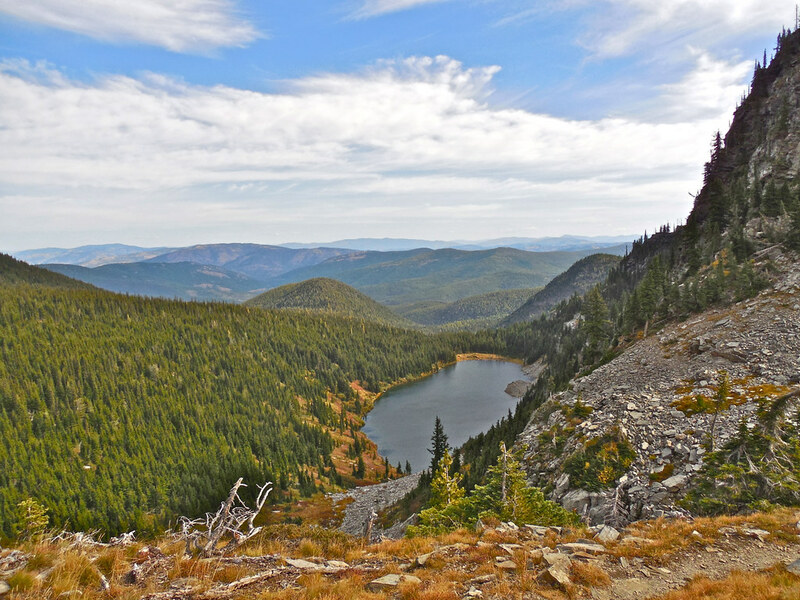 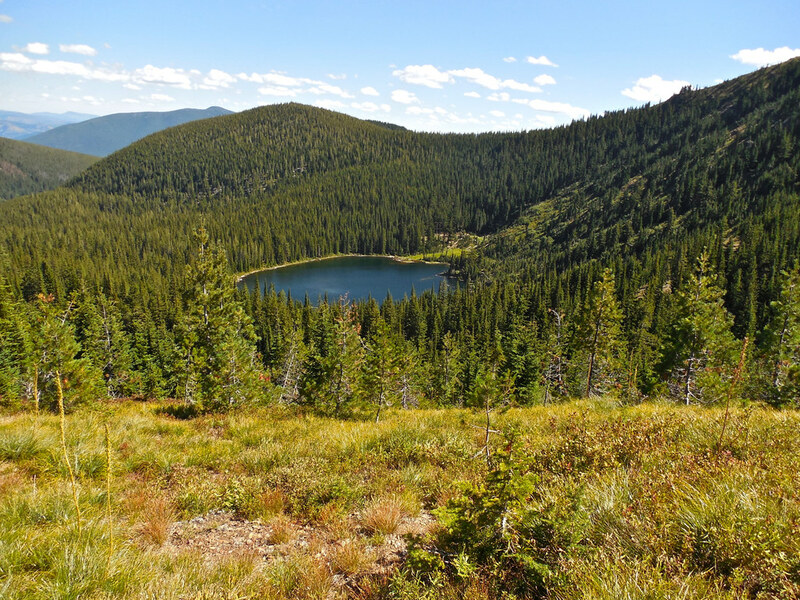 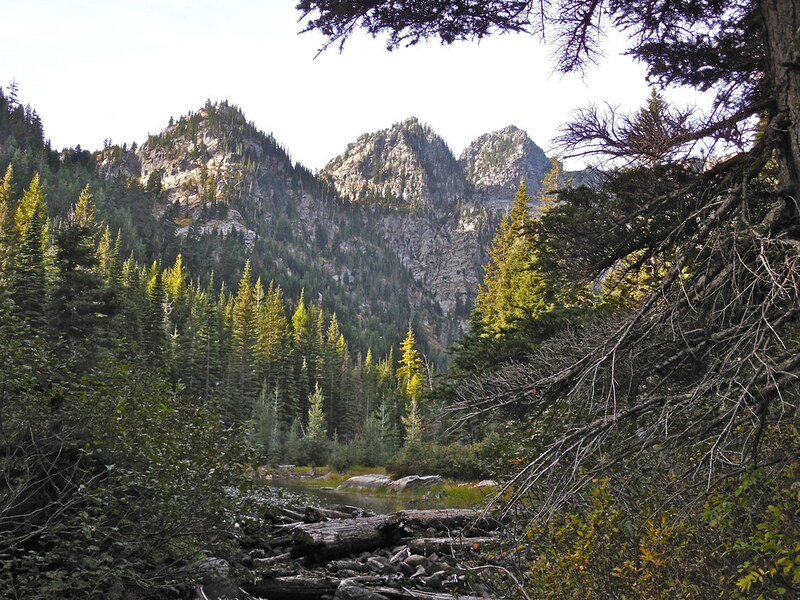 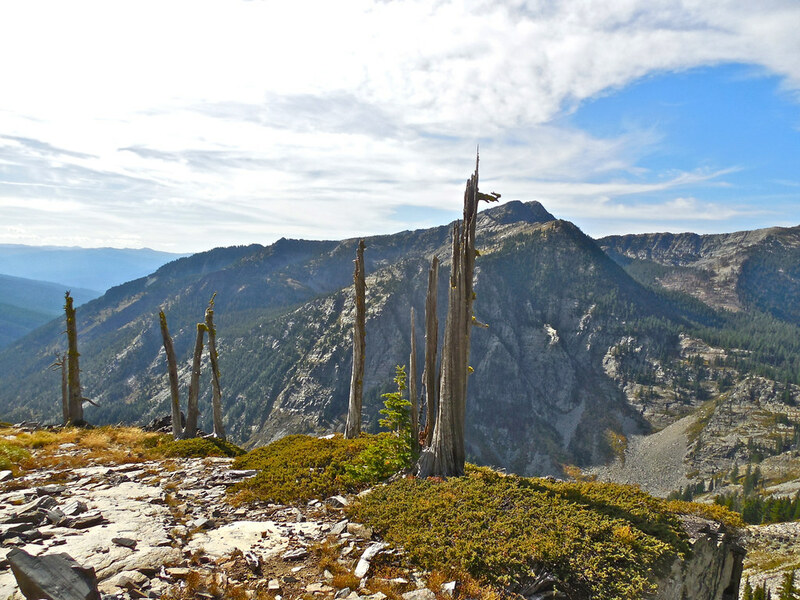 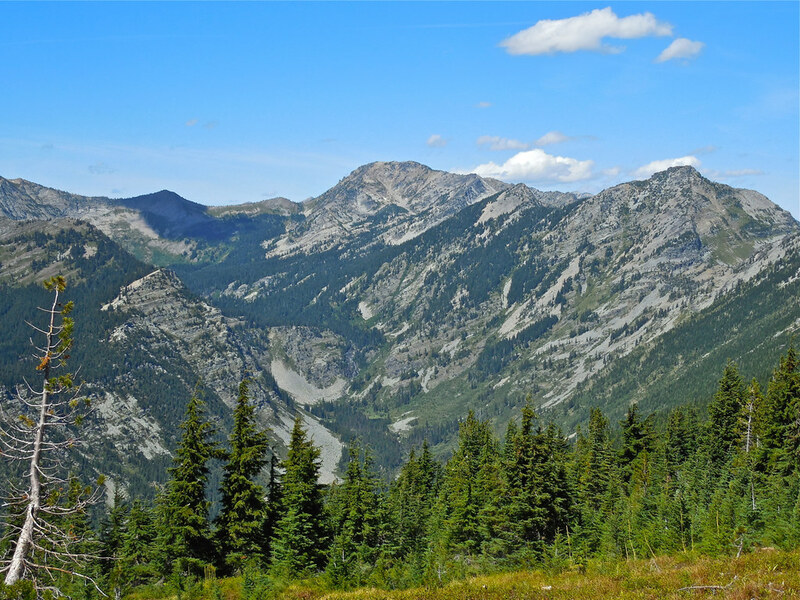 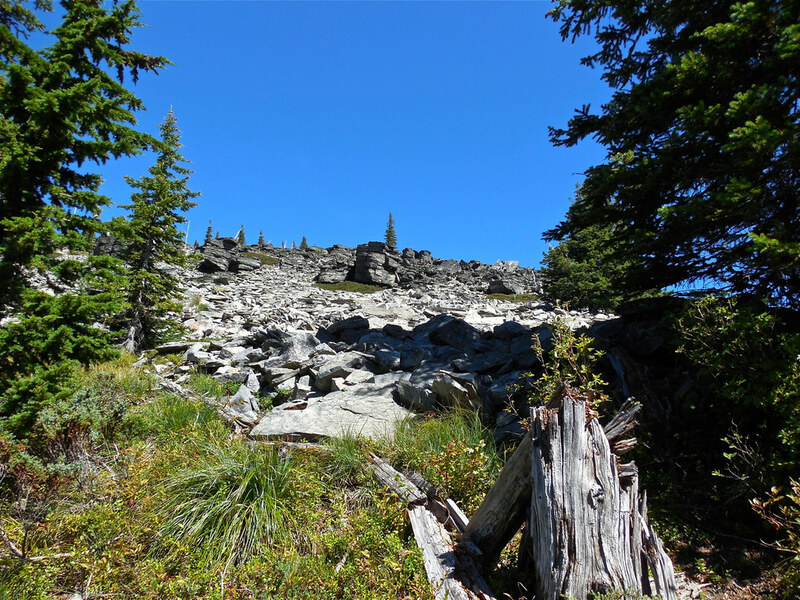 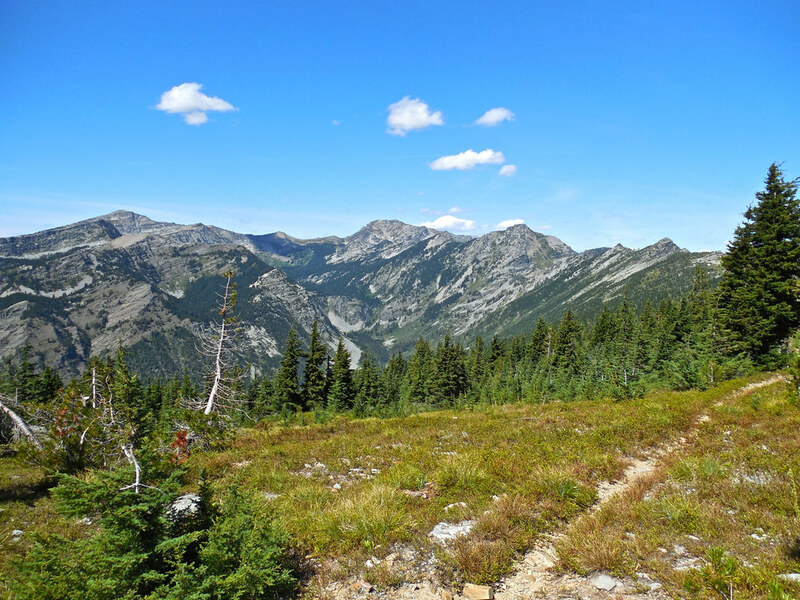 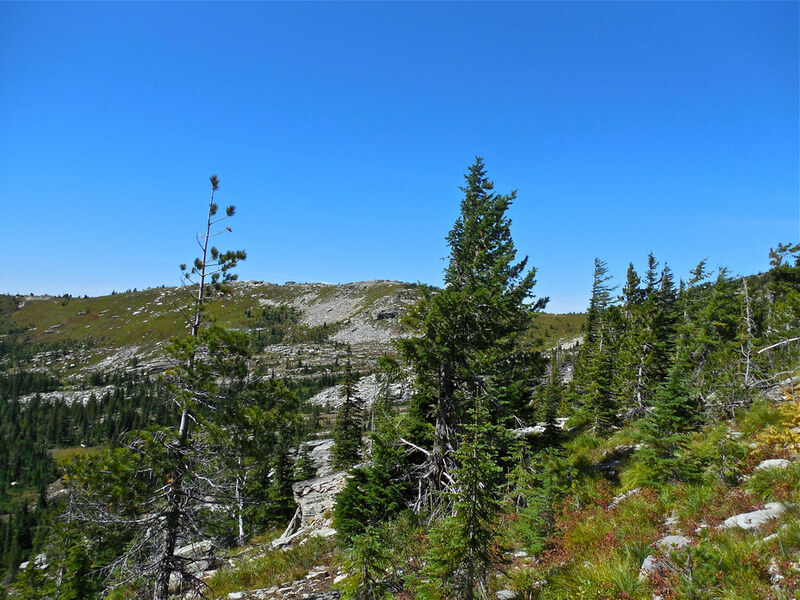 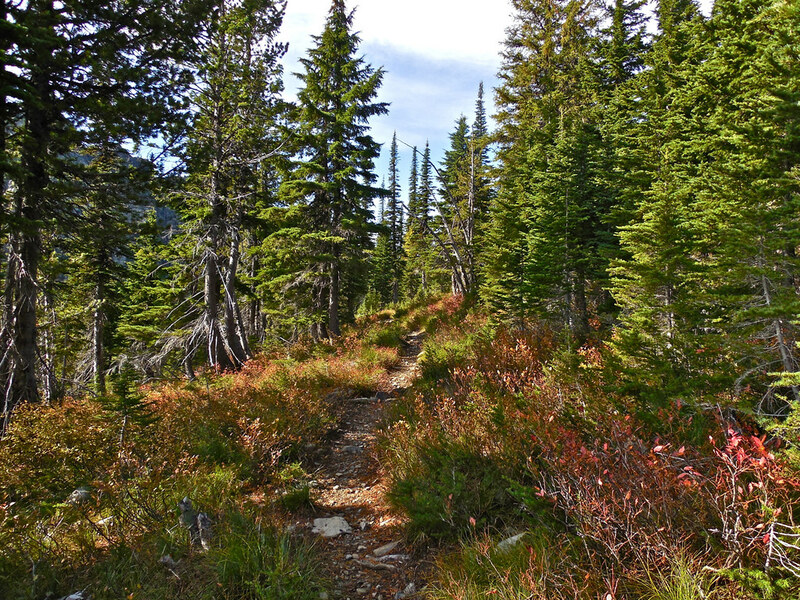 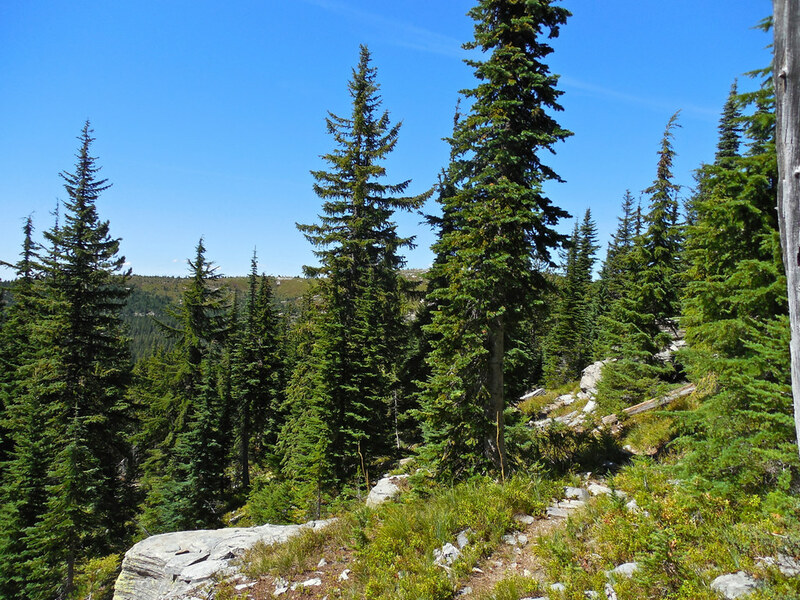 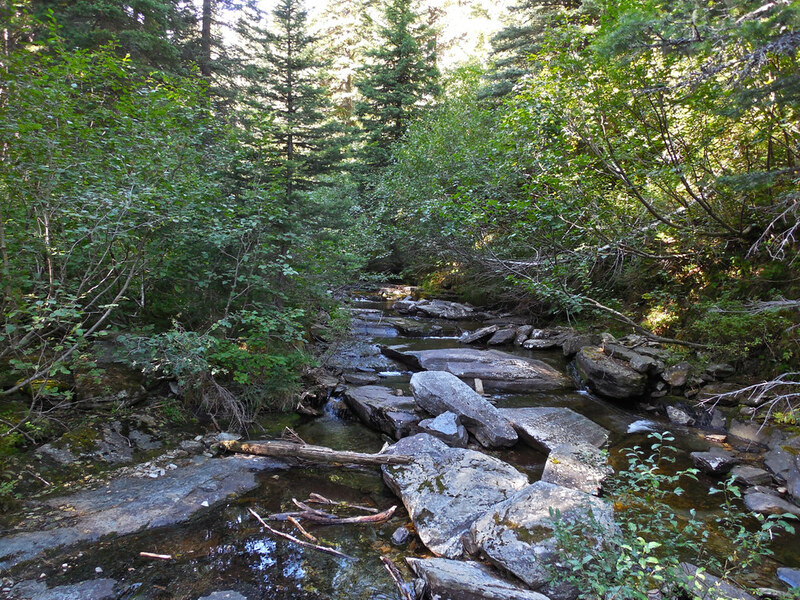 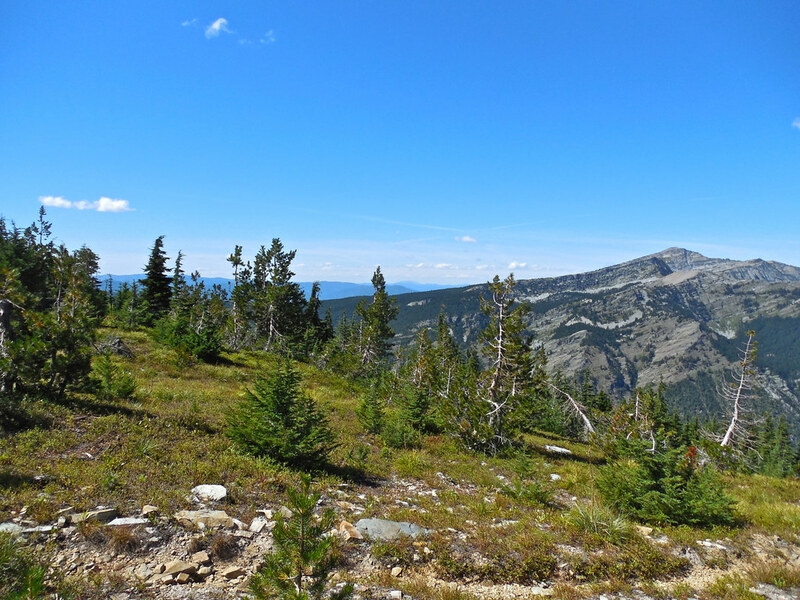 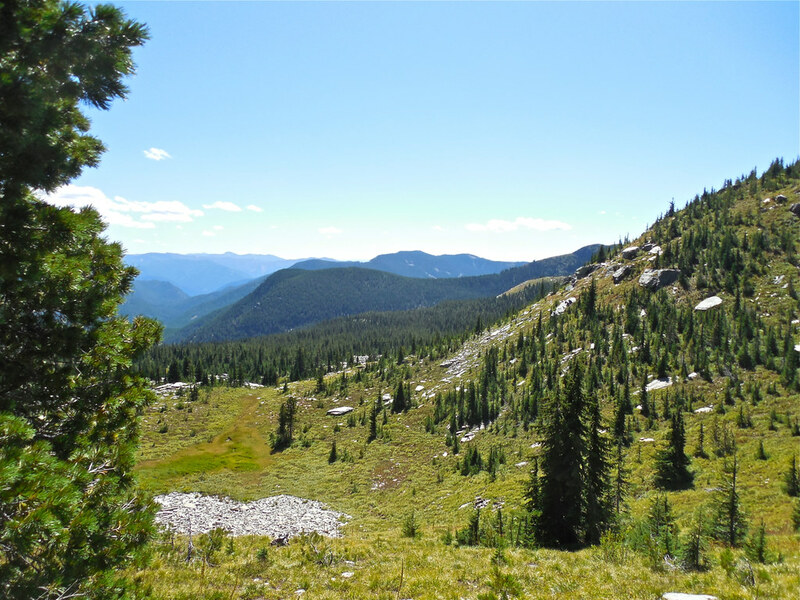 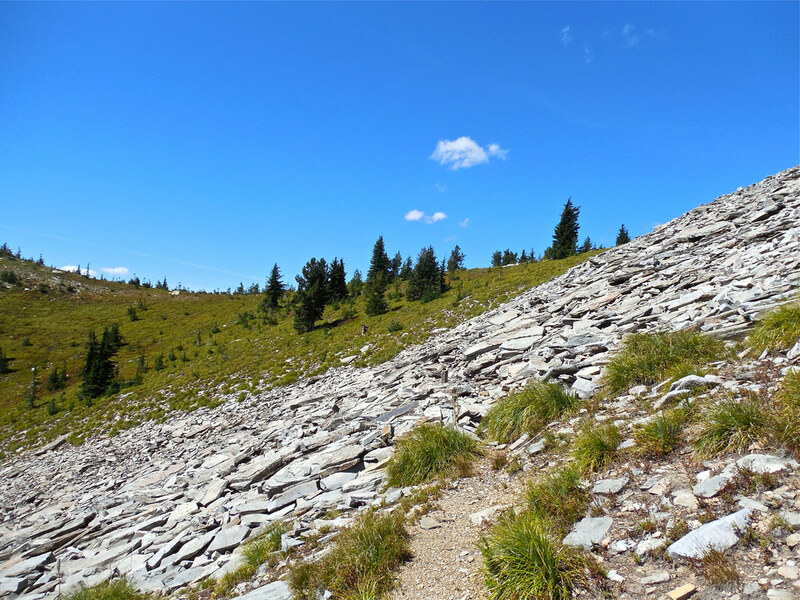 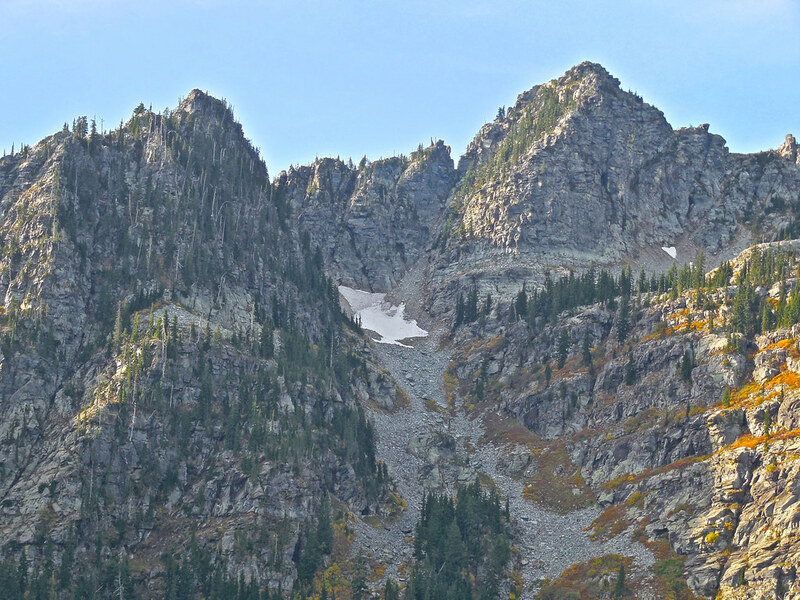 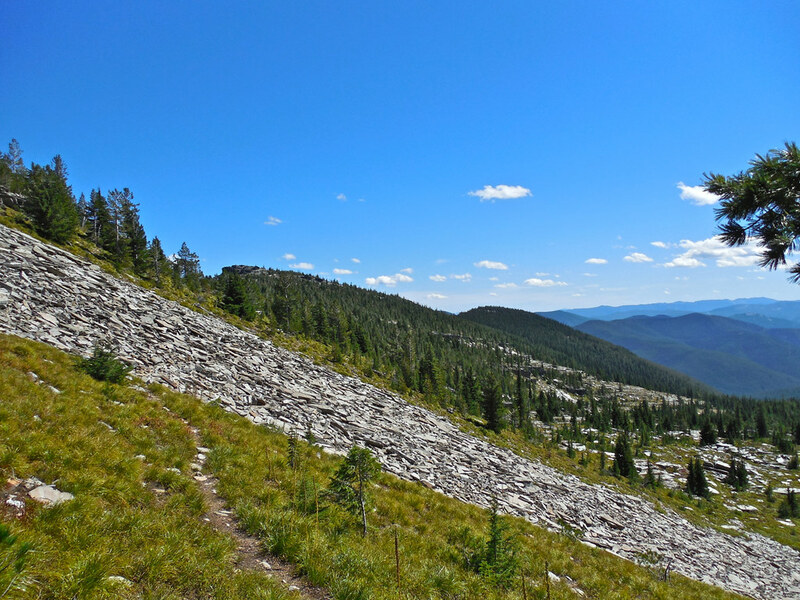 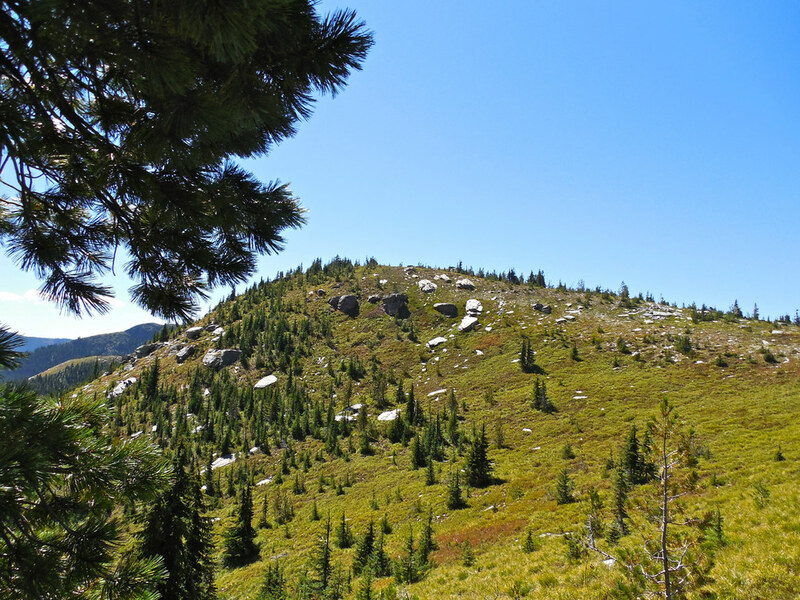 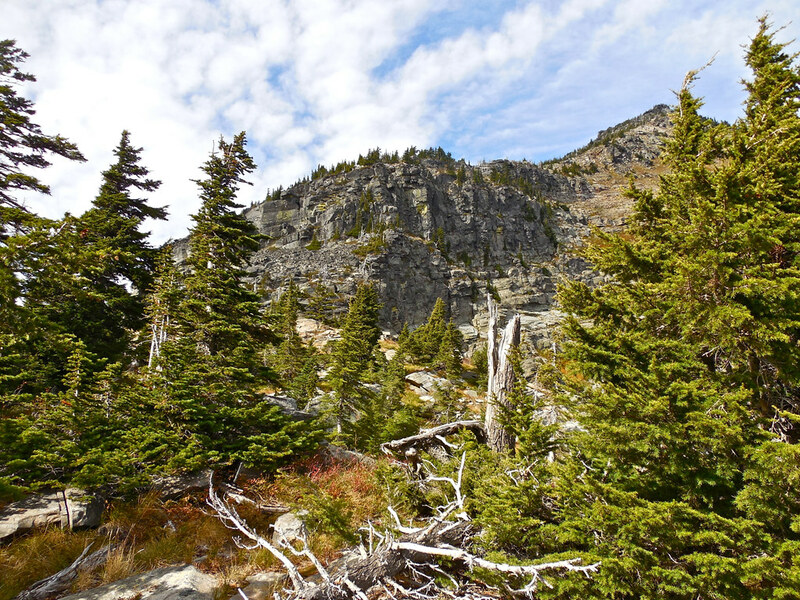 This is a photo tour of a loop hike on August 29, 2014 through the southeast tip of the Cabinet Mountains Wilderness. 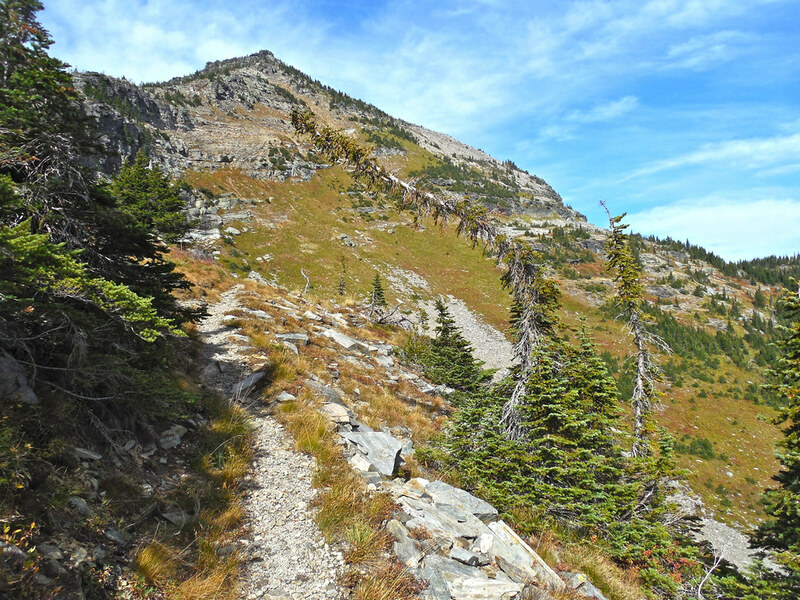 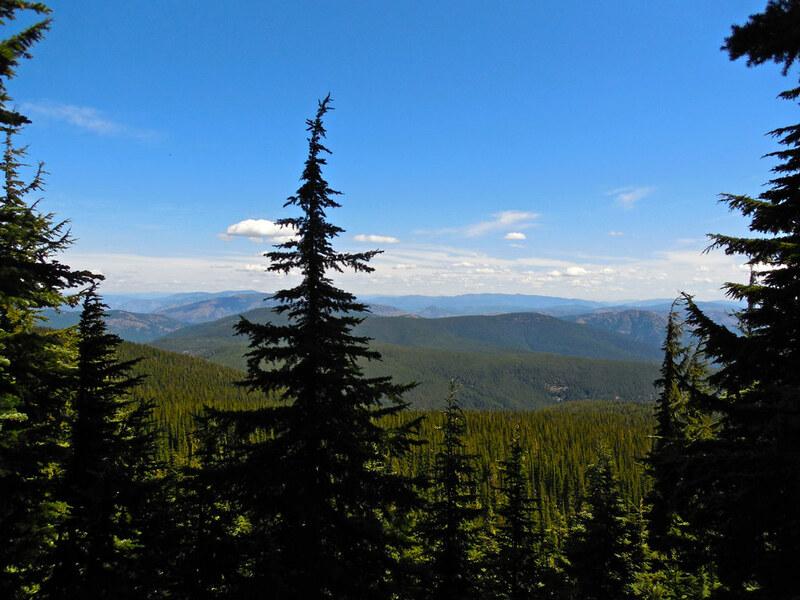 It started with USFS trail 178 at road 148 (3700 feet elevation) to USFS trail 63 then on 63 to USFS trail 360 (the Cabinet Divide trail at 6400 feet elevation). 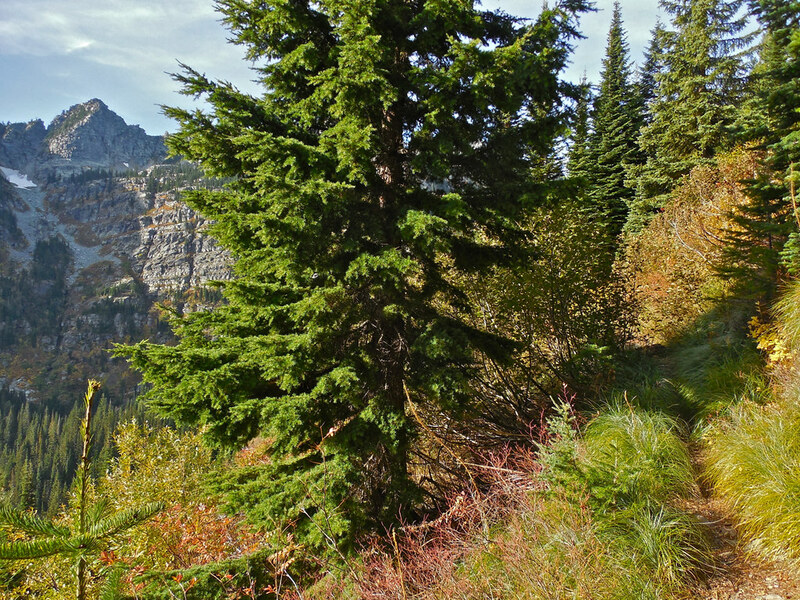 From there, south down the Cabinet Divide a mile and a half or so to USFS trail 489 and back down it about 5 miles to road 148 and up the road to the starting point. 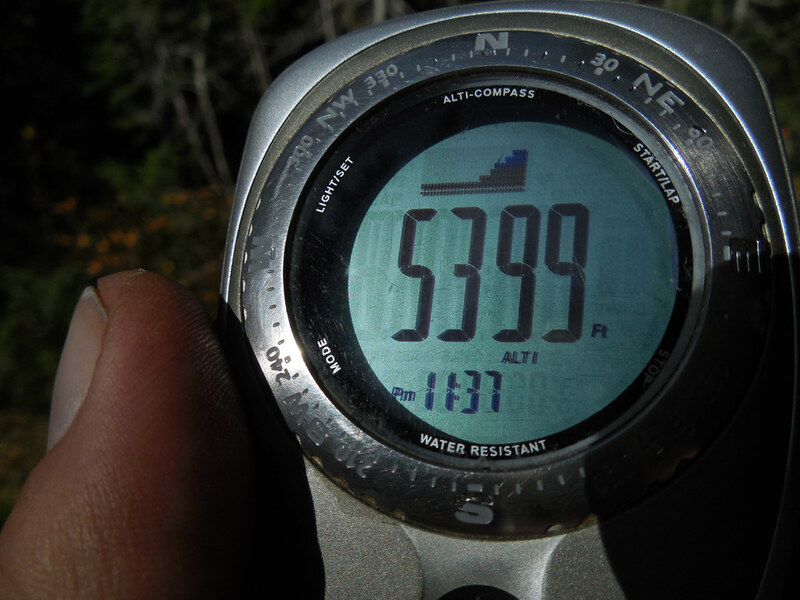 The total distance was about 11.5 miles and took 10 hours of hiking. 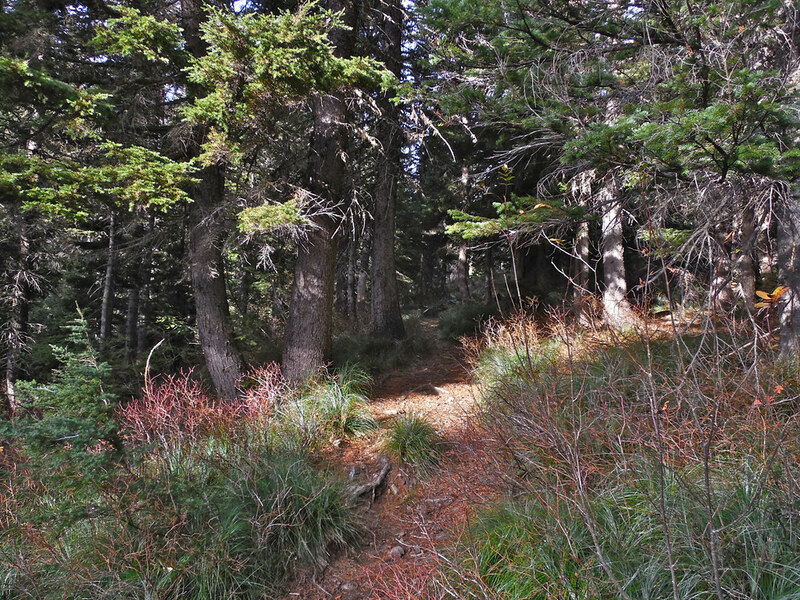 Trail 63: Baree Mountain at the left of the photo. 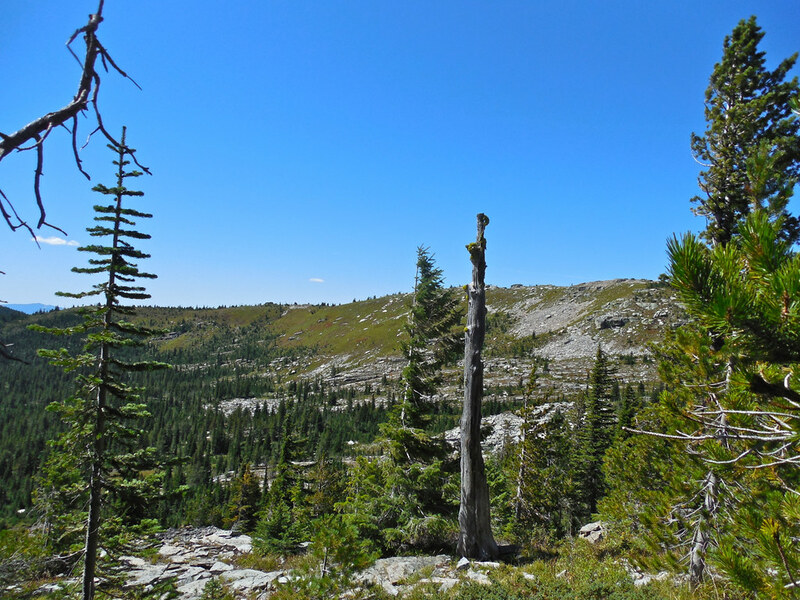 It is at the southern edge of the wilderness. 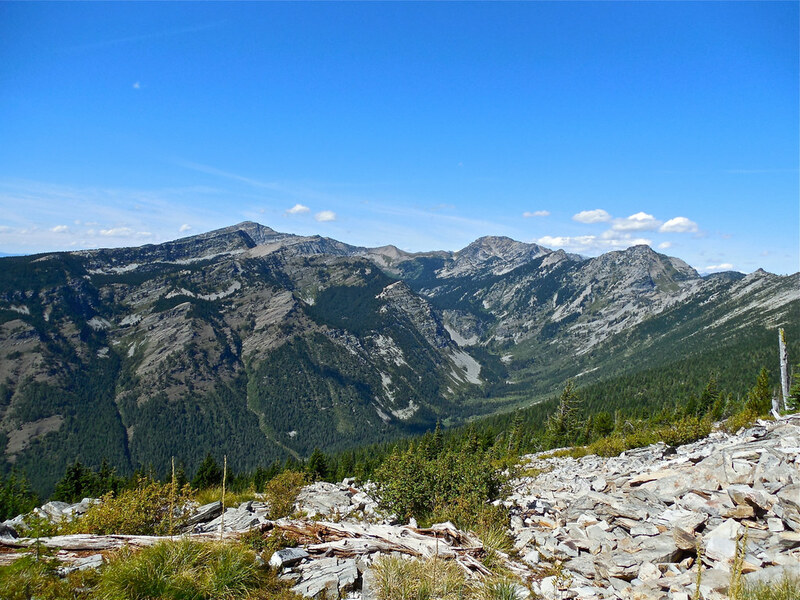 Baree Creek Basin photographed from USFS trail 63 as it nears the Cabinet Divide trail (USFS trail 630) in the Cabinet Mountains Wilderness of western Montana.